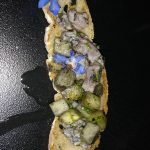 If you would like to discuss the possibility of my writing a review, an endorsement, blog posts, publishing photos & videos, providing social media exposure, etc., for your restaurant, please submit the form on the CONTACT page. I look forward to working with you! [SPONSORED] The first thing that you see when you walk into Nick-San Japanese Cuisine Restaurant in Cabo San Lucas, Mexico, is the central cooking area surrounded by the traditional sushi bar. Owner and Chef Ángel Carbajal will be the first to tell you, however, that Japanese Cuisine is more than just sushi. 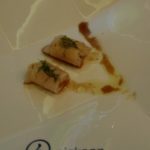 I had the pleasure to spend several hours with Ángel last weekend, and he explained his concepts, how he got some of his creations introduced into the famous Mastro’s Restaurants, what he wants people to know about Japanese cuisine, and what you’re not supposed to do with wasabi and soy sauce! We had eaten several items, including a couple rolls, before the subject of soy and wasabi came up. We’d not mixed any of the wasabi and soy, and then Ángel gave us an explanation. 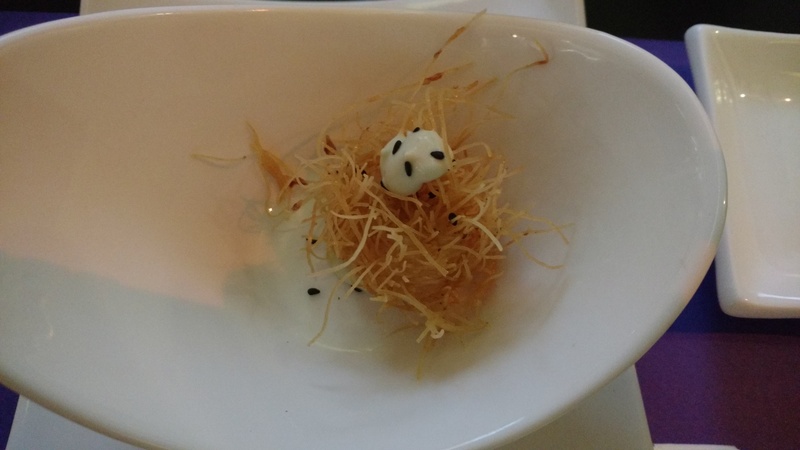 Too many people, he said, automatically pour soy sauce into the small dish and then vigorously ix in some wasabi. Then they put the pieces of sushi roll into that mixture and let the rice soak it up. WRONG, he says. 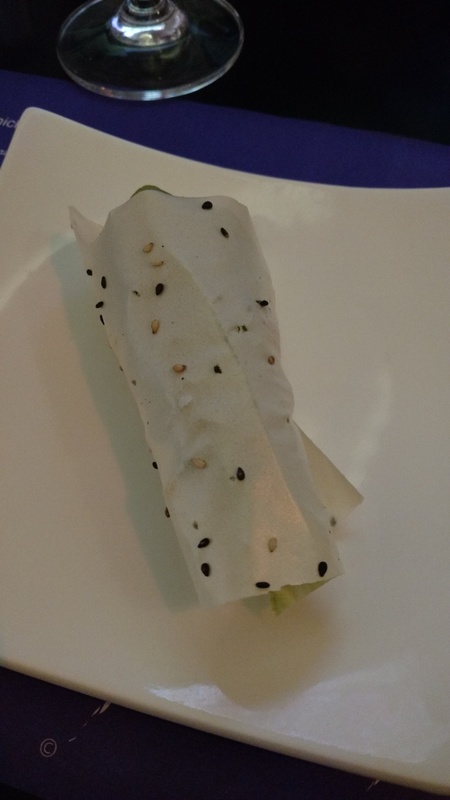 The idea isn’t to overpower the flavor of the roll; so he demonstrated the proper way. 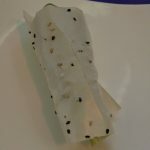 You take a little wasabi on your finger and wipe it on the top fish or the outside of the roll. You then quickly, and lightly, dip the roll (top down) into the soy to get just a little flavoring. Then eat the roll. It’s that simple. Even though we had several different rolls (not all pictured here, we never used the wasabi and soy — the flavors created were already too tasty to interfere. We had more items than what I’ve shown here; we also had a Zuke roll and a Lobster Toll. Admittedly, it was only a piece or two of each; we didn’t consume entire rolls. 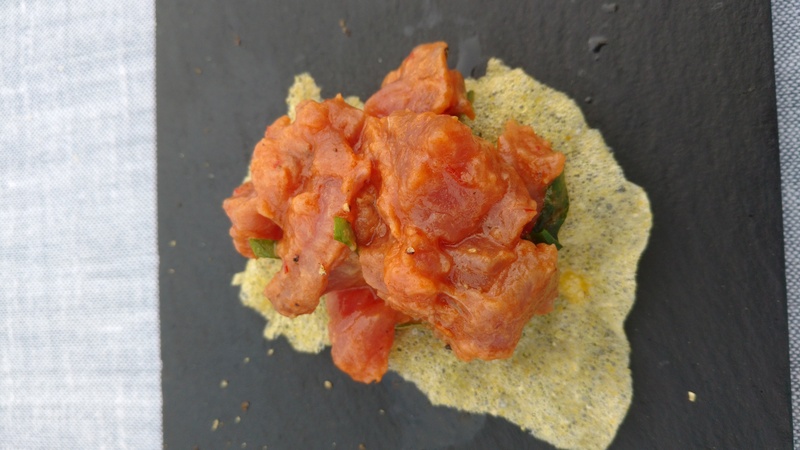 Chef Ángel said that he uses 70% local products as he develops and prepares his amazing creations. 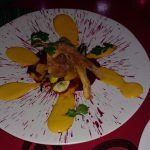 He likes to incorporate mango, the local fish and seafood, vegetables such as jicama and serrano peppers. He also uses Sesame Oil, something I love to use as a base when I’m making a stir-fry at home. “It’s something for everyone,” the charismatic owner and master chef said when I asked him to describe what he wants people to remember about their Nick-San experience. And as he was greeting regulars coming into the restaurant, it’s quite clear that he has created the experience that people want to come back to have again and again. When asked what my favorite dishes were for the evening, The Shrimp Gorgonzola was clearly near the top. Breaking off pieces of the crispy tortilla and then grabbing some of the shrimp that’s covered in the tasty cheese . . . yummy! 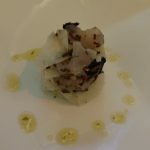 And the final entree was the Beef Fillet Serranito — Beef medallions, sweet sake, olive oil, black pepper, serranito sauce. All of it was perfectly blended into delicious tender bites. 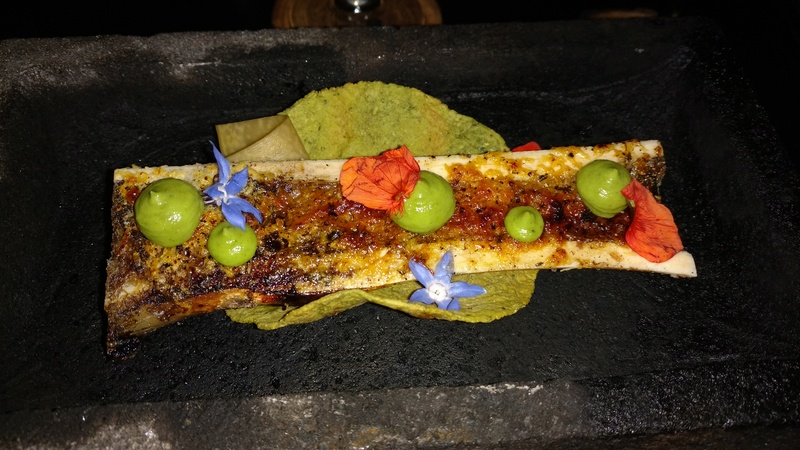 Click here to read more about the amazing creations from Chef Ángel. 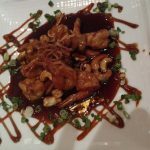 You will clearly find more than one thing you’ll love when you come to Nick-San Japanese Cuisine Restaurant in the heart of Cabo San Lucas. Whether it’s Ángel or one of his excellently trained chefs who is preparing your food, it will be a wonderful experience that you will share with your friends. 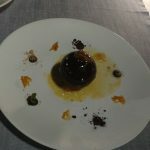 Watch my short YouTube video (2:30) I made while dining and chatting with Chef Ángel Carbajal. 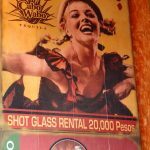 El Squid Roe: More Than a Dancing Scene! 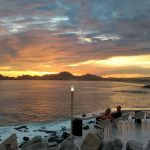 [SPONSORED] It’s no secret that El Squid Roe (the website elsquidroe.com is currently being worked on) has been the top nightlife scene in Cabo San Lucas for years and years. Now that that’s established, we can move on to the food. . . . I arrived at 8 PM, and Chef Manny was all set to prepare a most excellent meal for me. It started with my waiter Luis making a great tomato salsa right at the table. You need to watch my YouTube video to see how much effort goes into making this great salsa. After the portable gas two-burner stove was wheeled over, Chef Manny started to marinate 5 huge shrimp in some Chardonnay and a couple spices. As he heated the pan with oil and butter I knew I was in for a treat. The final result was a plate of gorgeous shrimp (watch the YouTube video as he works his magic) served with sides of vegetables and a potato salad. While I was enjoying his creation, he came by to remind me to save a little room for dessert. The portable stove came back as a two-inch thick pineapple slice was rolled in cinnamon and sugar. A heated pan with butter and Grand Marnier was used to sautée the pineapple to just the right consistency. The strawberries on top with ice cream and whip cream made the tasty treat even more tempting. If you can take one more video here is Chef Manny preparing my dessert. All in all, the service was excellent and the food was more than one could expect from a place known more for the dancing and the bar scene. 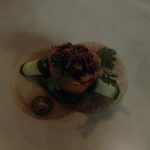 This all goes to prove that when you have an amazing chef like Manny, be prepared for an amazing meal. p.s. I’ve also posted a YouTube video of the bartenders dancing on the bar! [SPONSORED] When David Camhi decided to open La Lupita Taco y Mezcal in San José del Cabo, many people thought he was crazy. 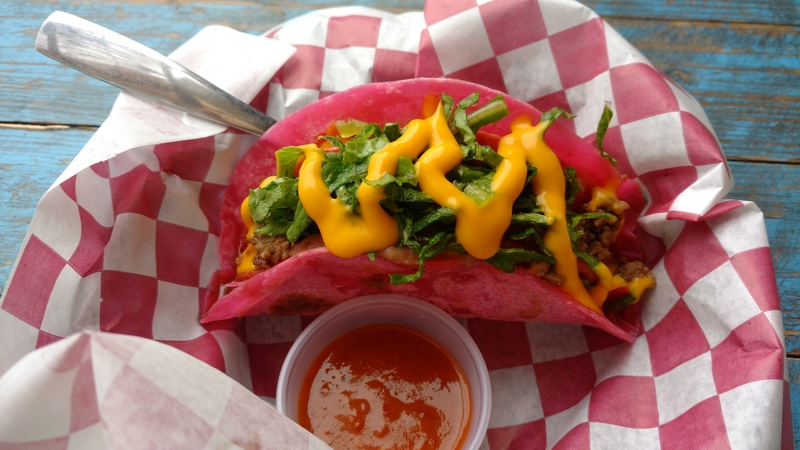 Not just crazy for opening a “taco place,” but because the locals had tasted thousands and thousands of tacos in their lives–they knew what good tacos were. Did David know what good tacos were? He thought he did. But before I began to enjoy some of Pia’s tacos, David wanted to tell me a little about Mezcal. You can see in this photo the array of mezcals that he currently has on hand at La Lupita. 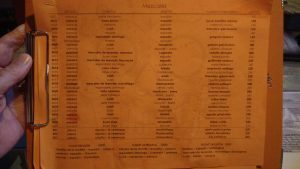 Considering that some of the bottlings are a total of only 150 bottles, the list of what’s available can be a moving target. 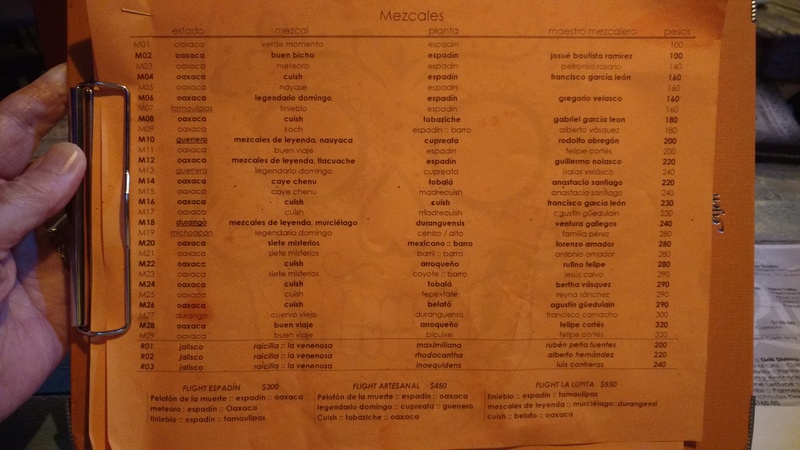 David told me about the different plants from which they get the mezcal: Espadín, Cuish, Cenizo, Papalόmetl, Arroqueño, Tepextate, and more. 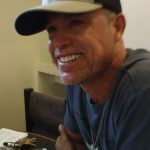 To learn a little more about mezcal, watch my 3-minute YouTube video where David gives me an introduction to mezcal. I thought mezcal was like tequila, but David made sure I understood the difference and why mezcal has more variety and flavor palettes. I now know why Mezcal has a smoky flavor and smell to it; it’s because they are cooked in a pit in the ground before being mashed. I also was not aware that there are so many different type of mezcal plants; some are ready for harvest in 8 years; some take up to 25 years to mature. That’s a long time to wait between harvesting. After David told me about mezcal, it was time to do the tasting. Here is a short YouTube video where he shows me the proper way to taste mezcal. after tasting some great mezcals ranging from 94 to 96 Proof (47% to 48% Alcohol), it was time to eat. 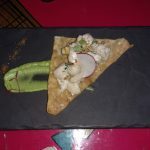 I started with a Cheese Crusted Pastor taco — a folded cheese crust is used as the taco shell instead of a tortilla. The Pastor meat and trimmings are put inside — it was absolutely yummy! 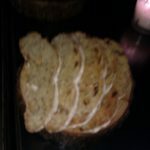 I also had some artisanal regional baked cheese from nearby Miraflores. 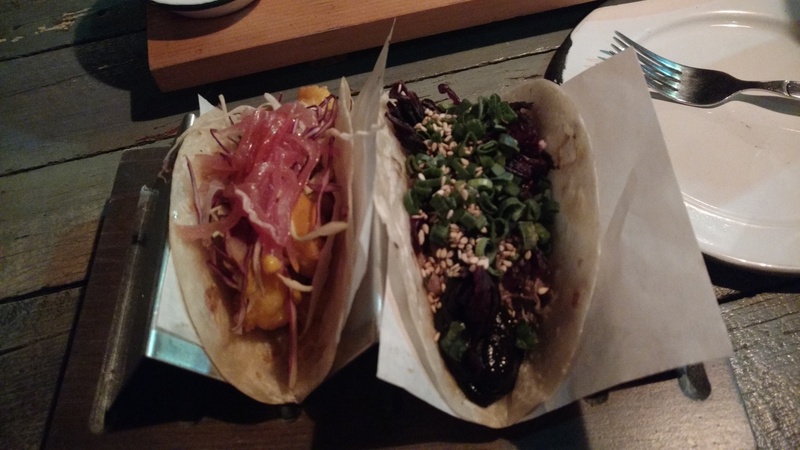 Chef Pia came by and suggested that I have two more tacos, the Duck Mole and their new Taco Guero. 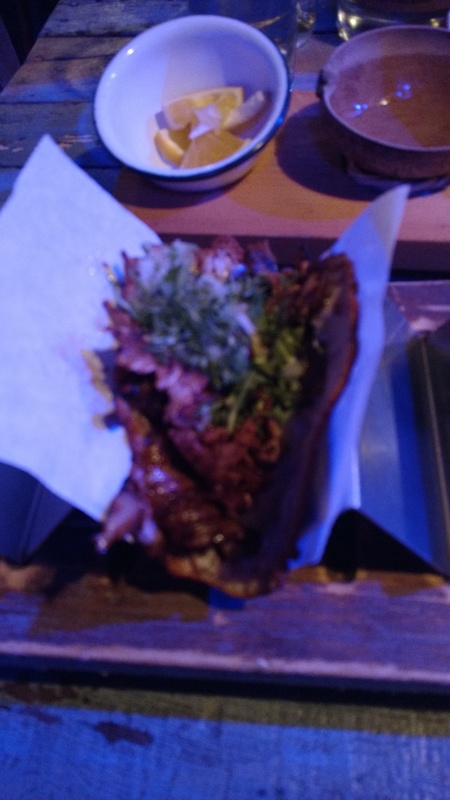 As the name implies the Duck Mole taco is shredded duck that has mole drizzled over it enhance the flavor — very good. 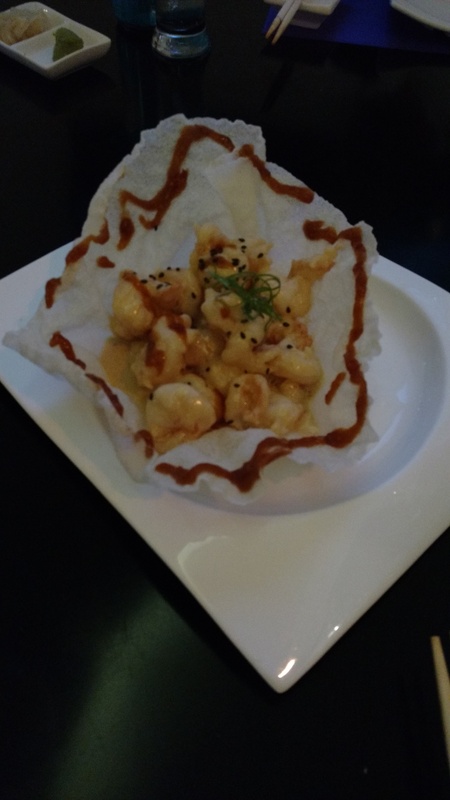 The Taco Guero was shrimp tempura with Turmeric and Curry. The pickled shredded cabbage made it absolutely flavorful and a great way to finish the meal . . or so I thought. 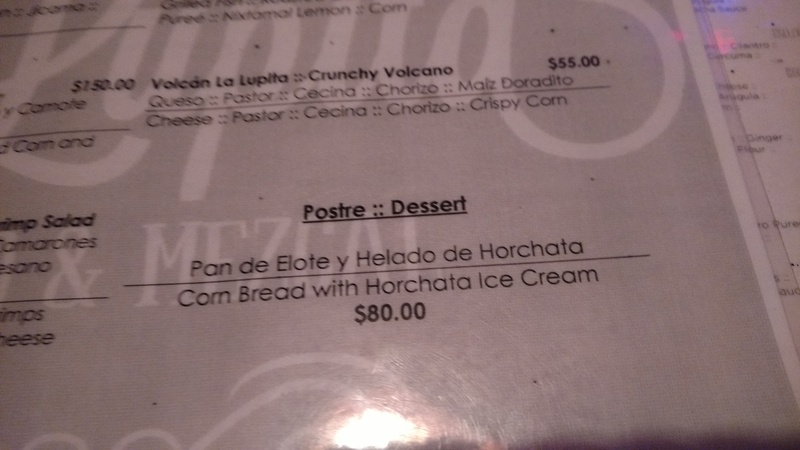 The Corn Bread with Horchata Ice Cream was so-o-o-o good. I wasn’t hungry, but the exquisite tastes left me no choice but to eat it all. 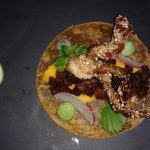 You might think that Lupita Taco y Mezcal is “just another taco joint.” It’s not — it is a taco and mezcal haven for excellence. 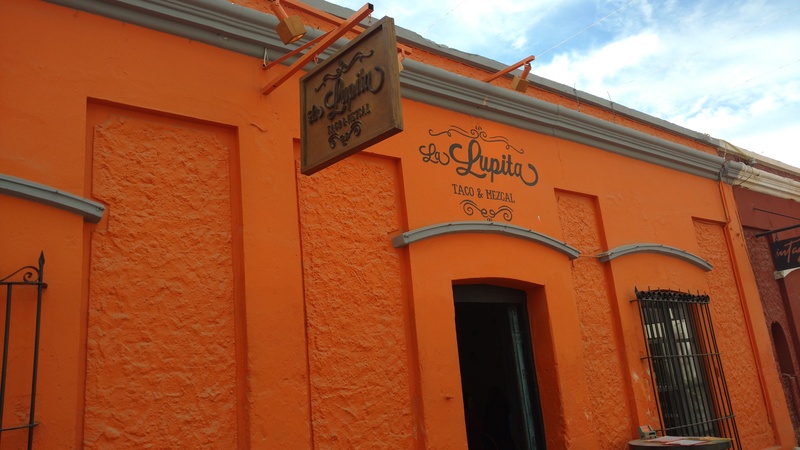 It’s right next to Baja Brewing in the Art District in San José del Cabo. [SPONSORED] I initially wrote this up on Valentine’s Day, a great day for PINK. 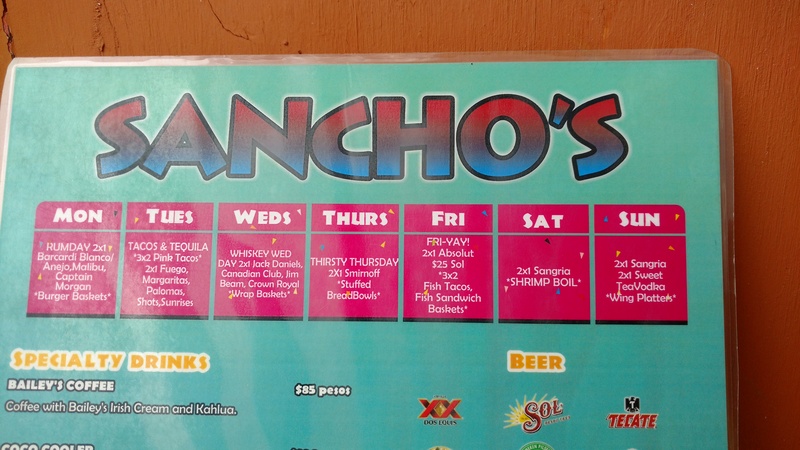 Yes; you read the heading correctly, Sancho’s Cantina along the marina in Cabo San Lucas is famous for its PINK TACO. 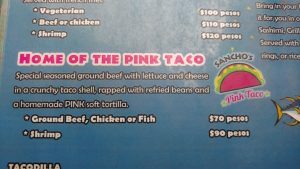 Whats the story behind the Pink Taco? Well . . .
Watch this YouTube video (2:30) for the story behind the Pink Taco and how it’s put together. 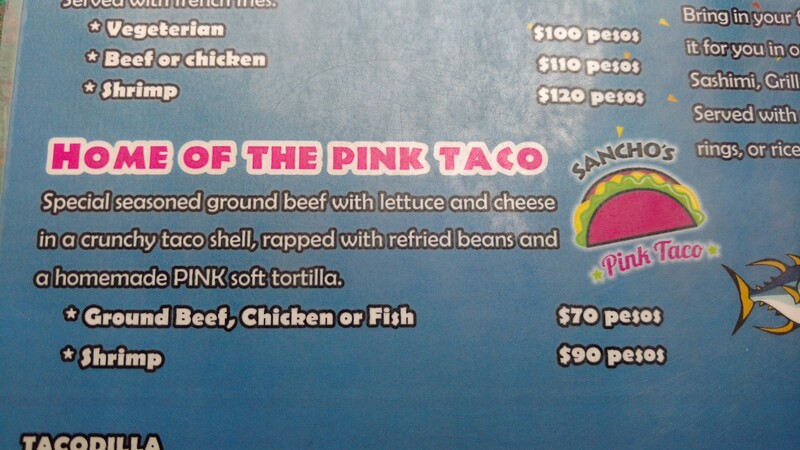 They start with specially made pink flour tortillas. 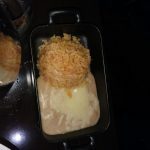 As Margo explained, the first one is fried into a hard shell and then all the trimmings are loaded inside and topped with some nacho cheese. (Both of us had the ground beef one) All of that is then wrapped in a soft flour tortilla (pink, of course) that has some rice and beans just in case the crispy one breaks—thus the fork. Ours didn’t break so we just enjoyed the tasty delight as some of the sauce slowly dripped down our hands. 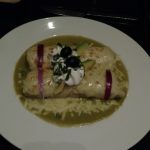 Watch the short YouTube video (0:54) and see why we enjoyed the Tortilla Soup and the Pink Taco. We started with a shared bowl of tortilla soup that had the flavor just right. It could have been a meal for one if we’d added a few shrimp to it, but I’m glad we had it as it was; it was a nice introduction to the tacos. 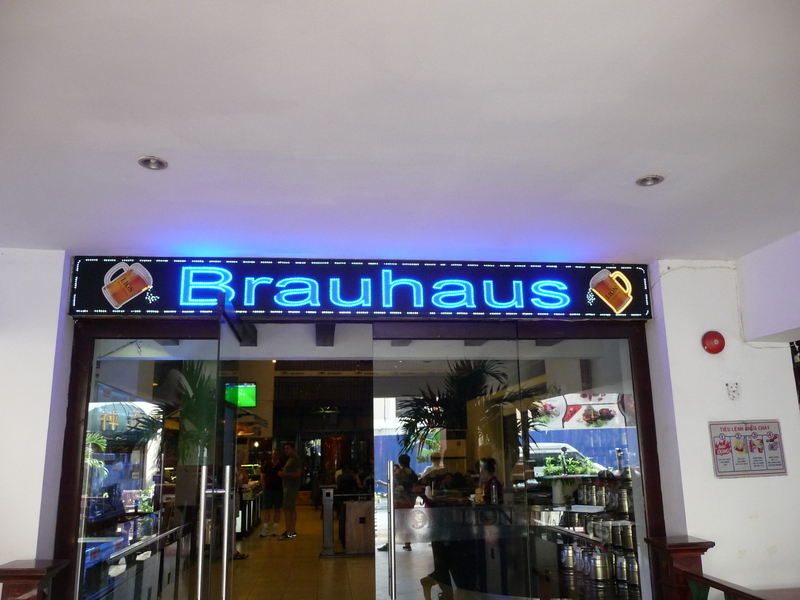 We asked what beer we should have and we were served Doz Equis Amber — perfectly chilled! 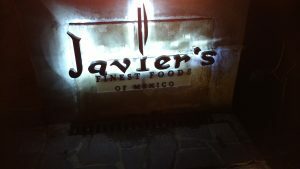 Javier’s Restaurant: Mariachis, Amazing Food, Beachfront, Service! [SPONSORED] As you wind your way through the elaborate Cabo Azul Resort—Diamond Resorts International’s spectacular gem in San José del Cabo in the southern part of Baja California—you might think you are walking through a peaceful jungle. That’s just the beautiful vegetation and water features that help to make this vacation resort so relaxing and inviting. 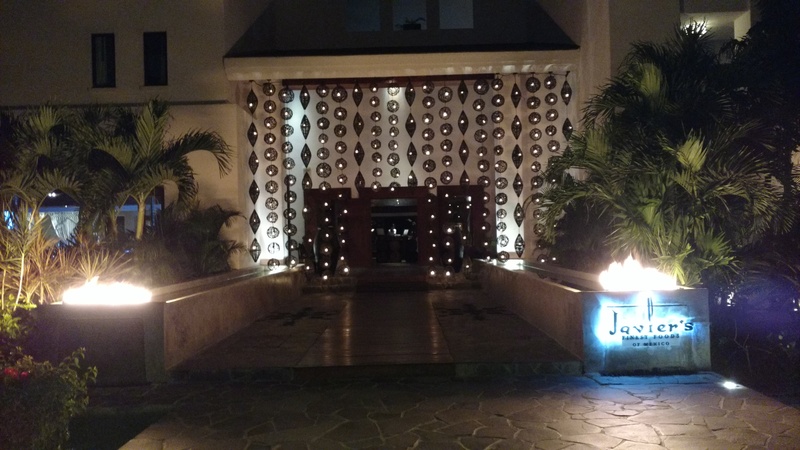 You know you’re about to embark on a magnificent experience when you reach the entrance to the spectacular Javier’s Restaurant—you have arrived! 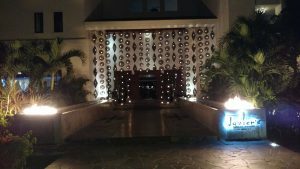 Walk through the majestic entry and be greeted by a charming hostess, the first of many people who are ready to ensure that your evening is nothing short of spectacular! The light 7 PM breeze from the Sea of Cortez was cool enough for some diners to ask for a blanket on their shoulders, but we were fine. The breeze died down shortly afterward and it the rest the evening was very pleasant. We could hear the waves assaulting the shore as they crashed; we always love that sound (so long as we are safely away from them). Our server Gregorio was every bit charming, helpful, and polite. 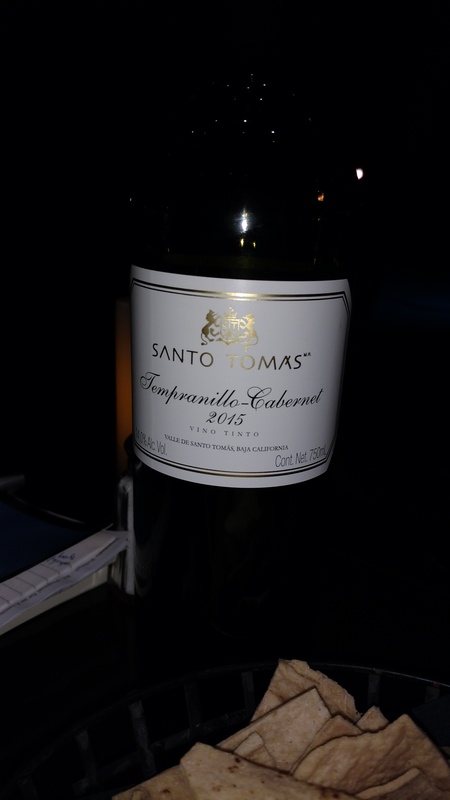 Rather than having a cocktail, we had a bottle of Santo Tomas Tempranillo-Cabernet wine, a very nice blend of Mexican and Spanish varietals. 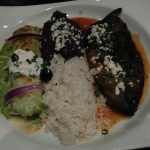 It turned out to be a perfect complement throughout the entire meal; even with the introductory basket of chips and a somewhat-spicy (but tasty) salsa. Watch the YouTube video (2:59) of the Mariachi foursome playing a “happy song” for us. 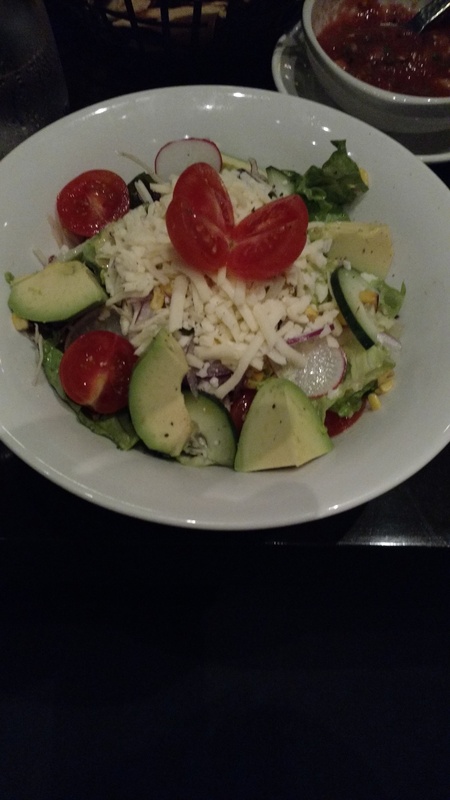 I started with the Javier’s Salad (no shrimp or chicken) that consisted of fresh greens with slices of avocado, onion, tomato, cucumber, sweet corn, grated Monterrey Jack Cheese, and a very nice house dressing. 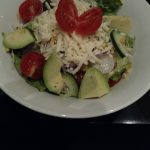 It was all very good, especially the generous portions of avocado! 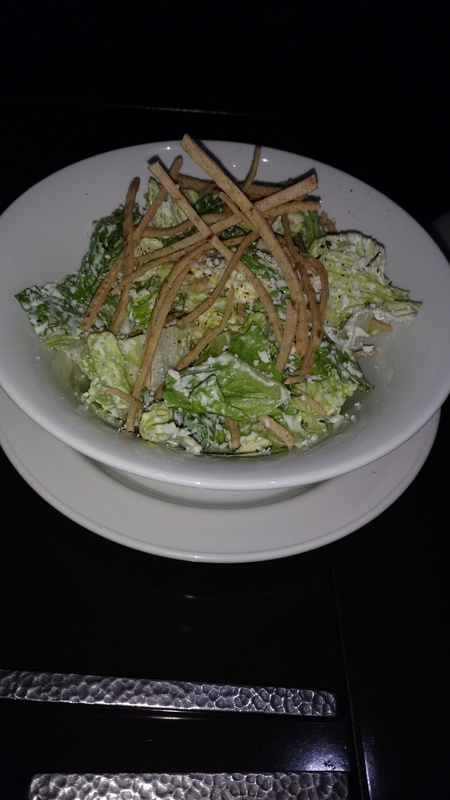 Darlene had the “Traditional Mexican Caesar Salad” served with chopped Romaine lettuce, crispy tortilla strips (those were a great addition), and a light Caesar dressing. 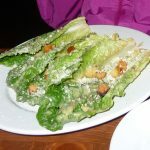 We were told that when locals have a Caesar Salad, they don’t like a strong dressing; so the restaurant (in keeping with local flavors) uses a lighter dressing. 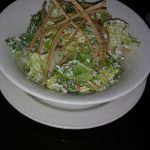 She said that the crispy tortilla strips really made the salad into something special; we’ll have to give that a try at home! While Sea Bass as the Catch of the Day sounded nice, we typically do eat a lot of fish, and so we opted for the Especialidades del Mar, the “Specialties of the Sea.” I had the Cabo Azul which was a Shrimp Taco (on a separate plate), prepared Ensenada Style and served on a flour tortilla (waiter Gregorio recommended that I eat this first). 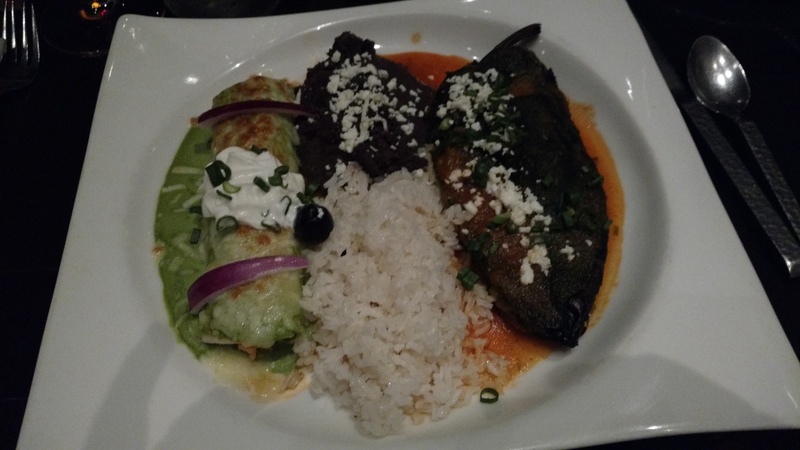 The second plate had the Lobster Enchilada in a light creamy pasilla sauce, and a grilled Chili Relleno stuffed with shrimp and topped with cotija cheese. The rice and black beans filled out the plate. I was able to eat the taco, half the enchilada, and half the relleno. The rest of the second plate was put into a container that is now in our refrigerator. 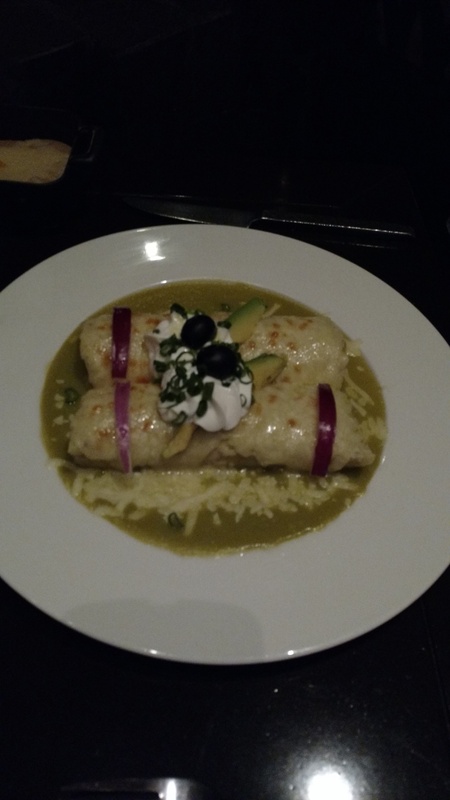 Darlene had the Seafood Enchiladas, a plate of two enchiladas that were stuffed with shrimp and crab, sautéed in garlic and onions, then covered in a tomatilla sauce and garnished with avocado slices and sour cream. 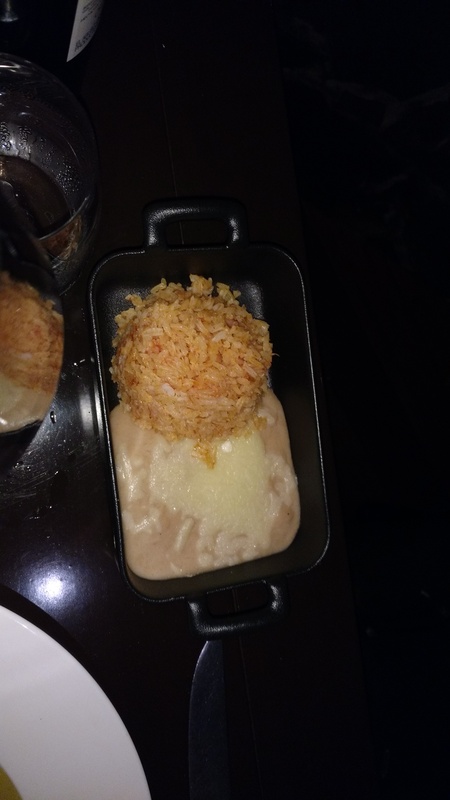 Her second “plate” was a small baking dish that held the rice and the beans that were covered with a melted cheese. Feeling that she might not be able to eat it all, Darlene neatly ate one of the enchiladas, while the second one plus the remaining rice and beans have also ended up in a container that is now in our refrigerator. We definitely have some nice food to enjoy as snacks or great lunch items! Watch the brief YouTube video (0:38) of our dinner. 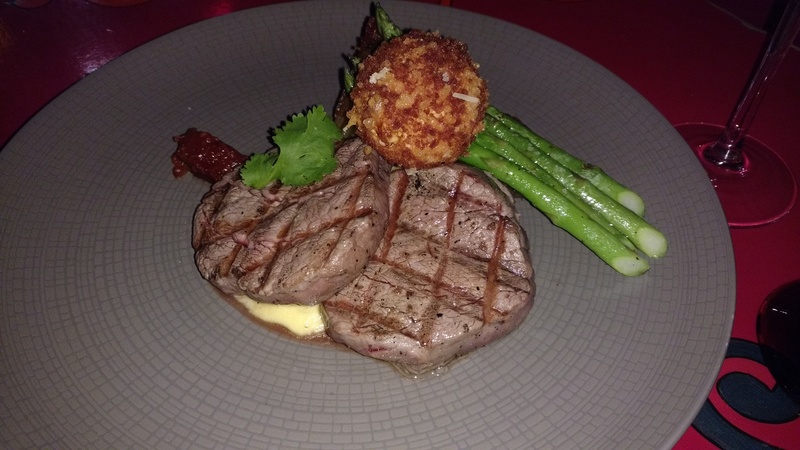 What are your plans for a relaxing and AMAZING dinner when you’re in San José del Cabo (or drive up from Cabo San Lucas as we did)? 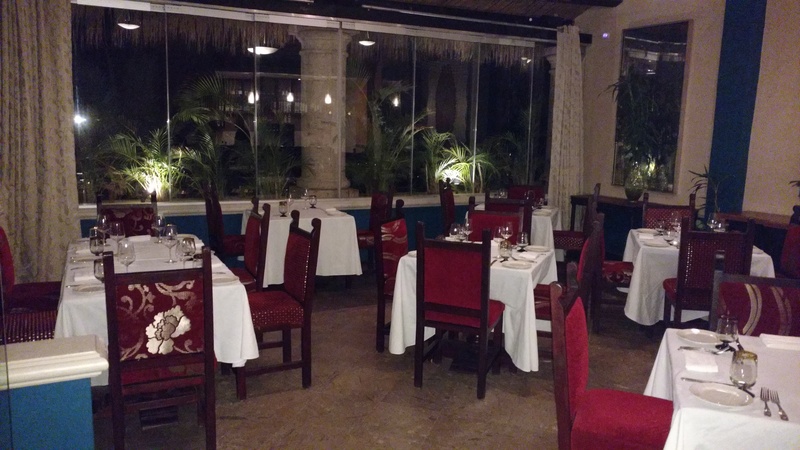 Come to Javier’s Restaurant inside the Cabo Azul Resort along the hotel zone. 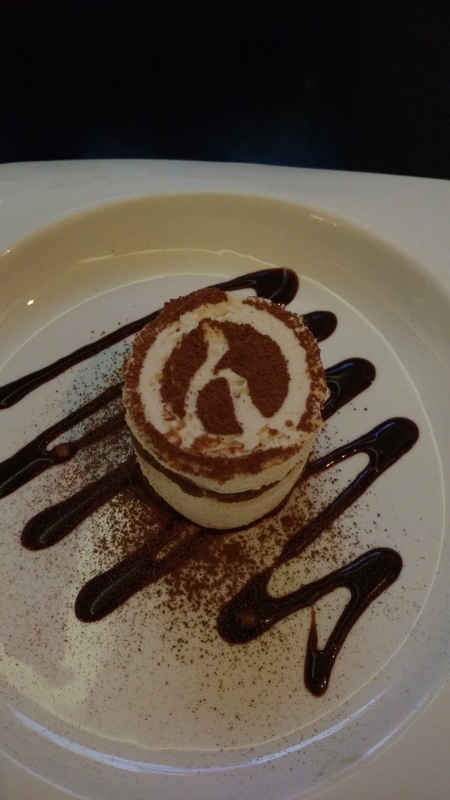 You’ll love the food, be enchanted with the view (even at night), and you’ll be charmed by the wonderful service! 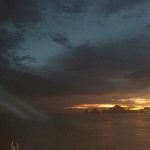 Sunset MonaLisa Restaurant Has it All: View, Food, Service, Ambience, Experience! 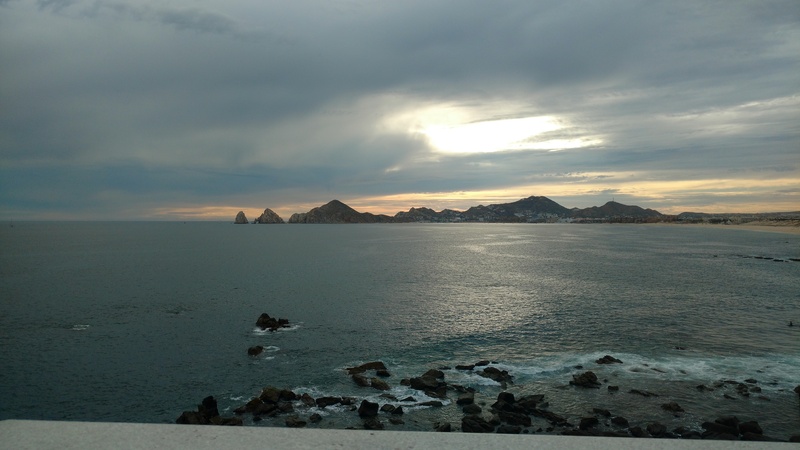 Is There a Better View in Cabo? 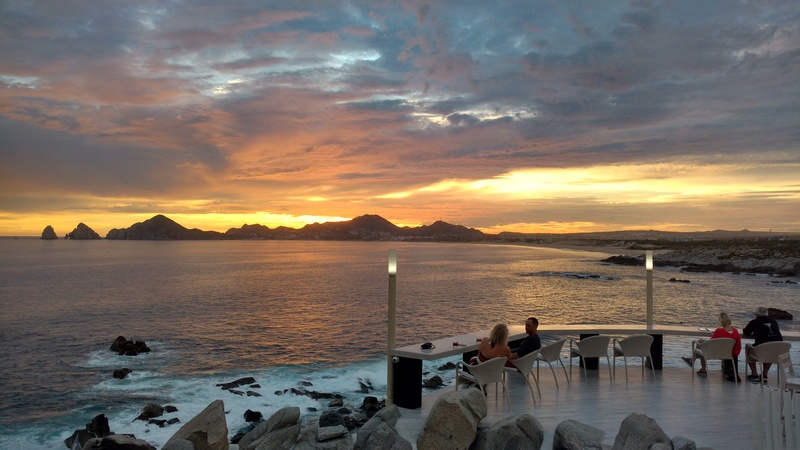 [SPONSORED] Sunset MonaLisa Restaurant just outside Cabo San Lucas on the Corridor. I don’t know where else you could have a truly amazing dining experience with such a marvelous view. And then once you add in the amazing service, the serenading, and the food—it’s just hard to top it. Looking straight-on to the Arch you can see why people love Cabo, and why Sunset MonaLisa is so popular. As you saw in the video above, our evening started with a glass of champagne while we sat at the edge of the rocks with the view as seen in the photo here. We saw surfers down below navigating their way through the rocky areas, enjoying the short but apparently fun rides through the surf. We were warmly greeted by Jessica Armenta, the Marketing and PR Manager for Grupo Monalisa, and by Giuseppe Napoli, the Director of Operations. Jessica, Giuseppe, and the entire staff made us feel very welcome. Part of the amazing experience here at Sunset MonaLisa is watching the sun go over the hills as it sets into the Pacific Ocean. You must watch this beautiful YouTube video (0:35) of the setting sun and you’ll see why this location is so popular! 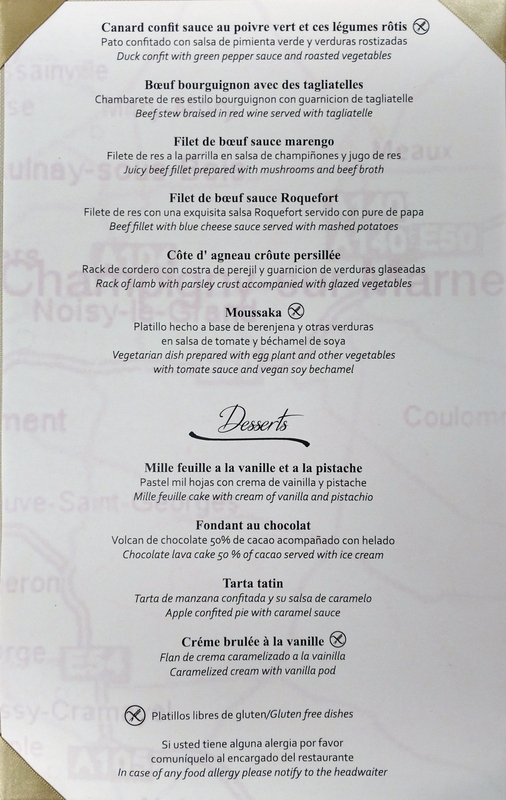 We enjoyed a “Tasting Menu” for dinner, and the carefully prepared flavors were delicate yet noticeable. 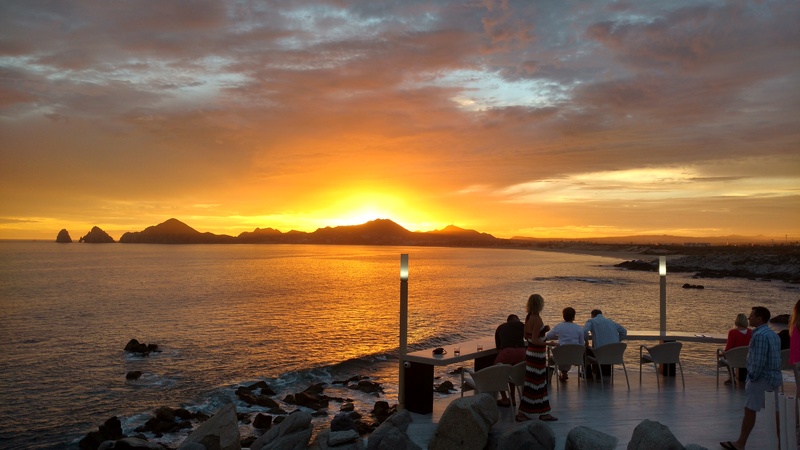 The next time you’re in Cabo San Lucas, or even in San José del Cabo, your memorable evening should be at Sunset MonaLisa Restaurant; you can’t go wrong! 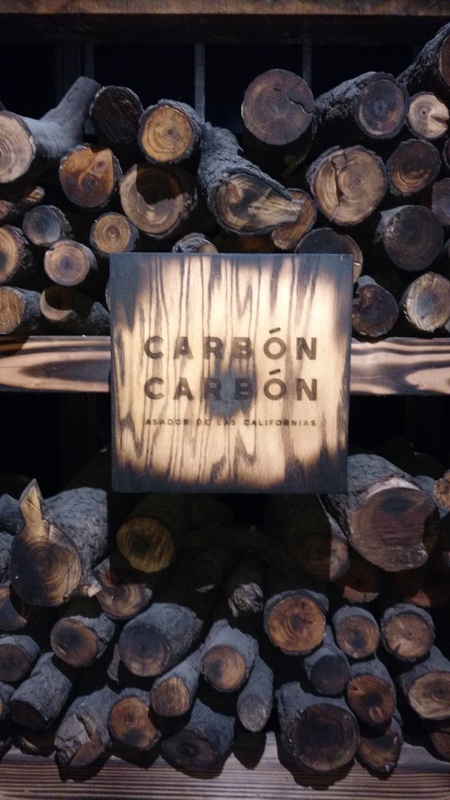 [SPONSORED] Some of my Spanish-speaking friends have already commented on the name of this restaurant, particularly the second half of it. The name of the restaurant is CarbόnCabrόn, and, yes, the second part by itself is one of those “bad words” we’re not supposed to say. Our hostesses for the evening, Mariela and Alicia, explained that it would be like our saying, “That blankety-blank fellow” or something similar. 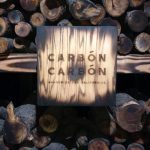 Anyway, that’s the name of the restaurant, and it really does have a lot to do with Carbon—you know, that element with atomic number 6 in the Periodic Table that we all memorized in Chemistry class and immediately forgot once the class was over. 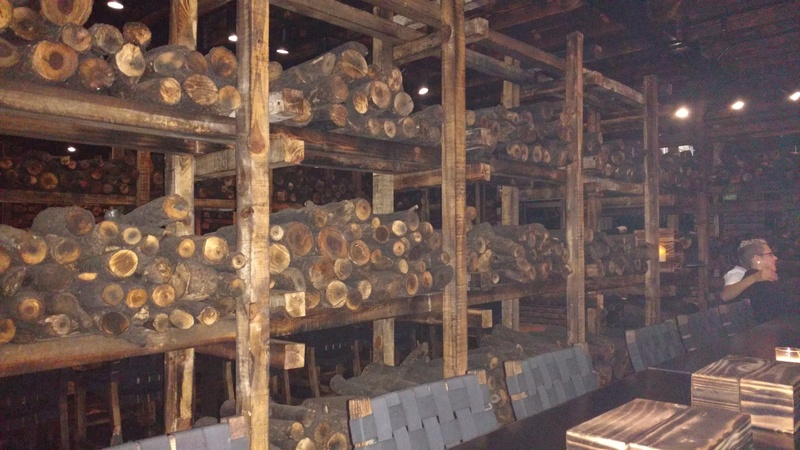 Stacks of wood that have been “burned” to give them a darker color are used as dividers between the rows of tables, but that wood is never used for cooking. Charcoal (or ash) is incorporated into most of the dishes. 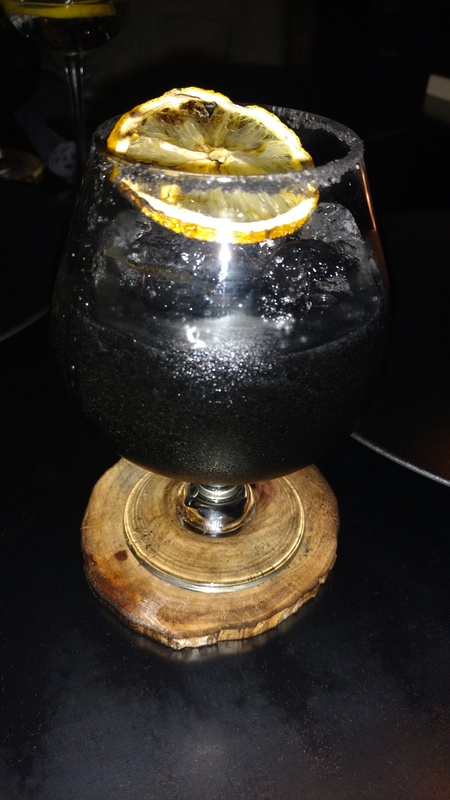 The Margarita (served with Mezcal instead of Tequila) had some ash mixed in to give it the black coloring. Sweetbreads (not sweet breads), without going into detail what parts of an animal are their origin (you can find that out on your own), made an excellent appetizer. Here are the details I got when I asked about their preparation: After blanching them for 10-15 minutes in milk and nutmeg, they are marinated with lemon and clarified butter and chilled. 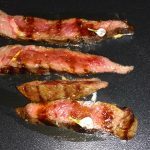 They are then put on the grill (over charcoal, of course) for just a short time, turning once, so they are crispy on the outside and tender on the inside. 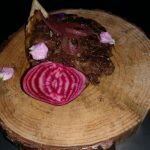 The plate is garnished with some purple onions and a grilled lemon wedge, and the final touch is a tasty slice of watermelon radish. We had a knife for cutting, but they were so perfectly prepared that the fork was sufficient. 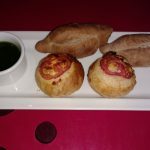 CLICK HERE for a short YouTube video (1:15) on our dinner at CarbόnCabrόn. 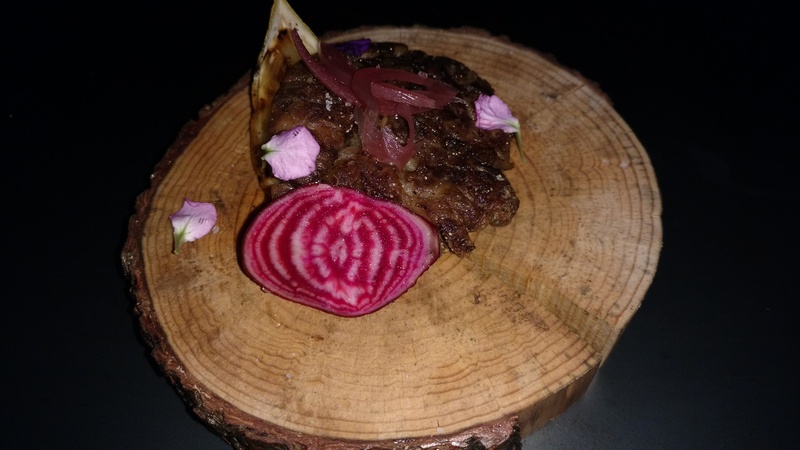 In case you haven’t guessed it already, wood is everywhere; the coasters are a thin slice of a tree branch, and each serving of sweetbreads was served on wood. Speaking of appetizers, there were more! 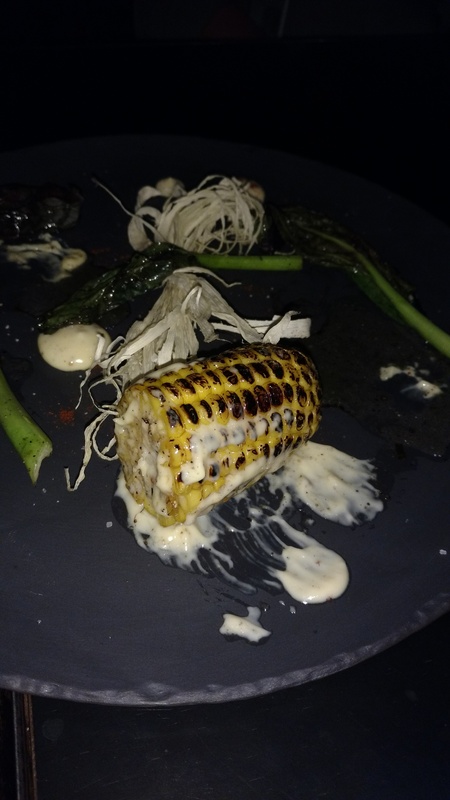 We each had a plate that had a half ear of grilled corn, two spinach stalks, some shredded radish and a few mayonnaise dollops for dipping the corn. 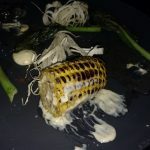 I wasn’t expecting to be eating without utensils, but they brought plenty of napkins to sop up the dripping mayo and whatever comes off of cooked corn. Still more. 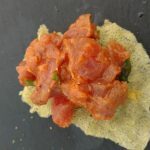 Next was a plate of Yellowtail Ceviche to share (thank goodness) served with some homemade bread. 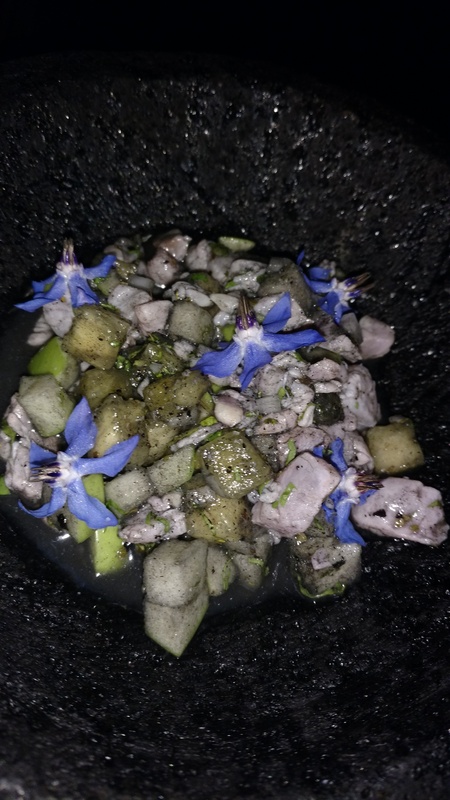 The Yellowtail was combined with chopped pineapple, Persian cucumber, charcoaled habanero, and lemon. 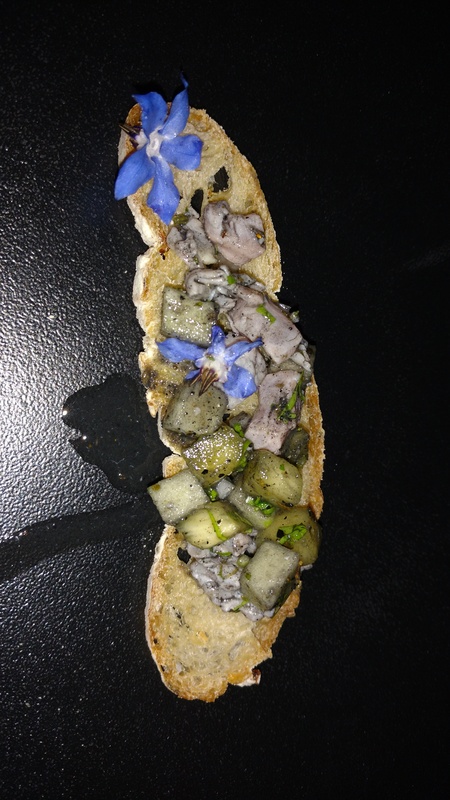 Apparently the little purple flowers aren’t part of the recipe, but they didn’t taste all that bad. The daily-fresh Yellowtail was excellent, so tender and moist and flavorful. One salad and three appetizers later, it was time to bring the entrees. Yes, your read that correctly. The saving grace was that we were served smaller portions of each entree (thank goodness or we might have exploded right there!). 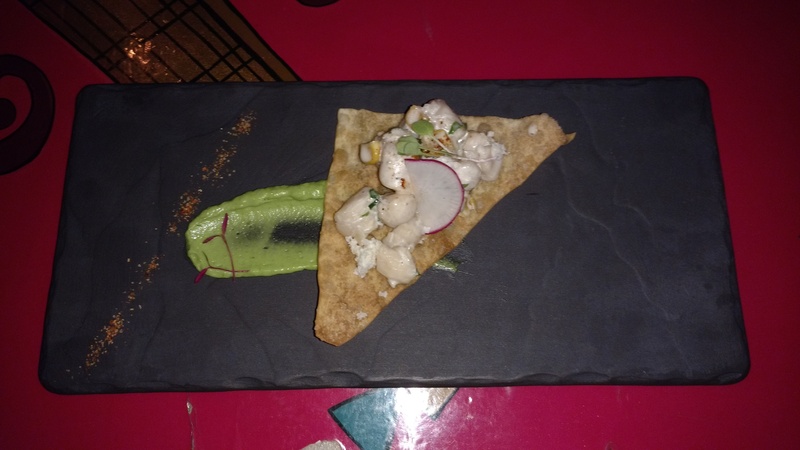 The bone marrow was topped with a Parmesan crust, some avocado mousse, and tortilla toast for eating it like a chip and dip. This could be a tasty appetizer when only one half-bone is served. I’m certainly not complaining about portion sizes as we had all that we could eat. The final entree was a super-moist and tender Wagyu Beef, with four slices for each of us. 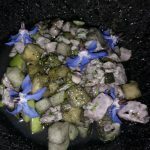 I had to personally compliment Chef Miguel as he was the one who prepared the sweetbreads, the bone marrow, and the Wagyu (from our state of Idaho) over the charcoal grill. 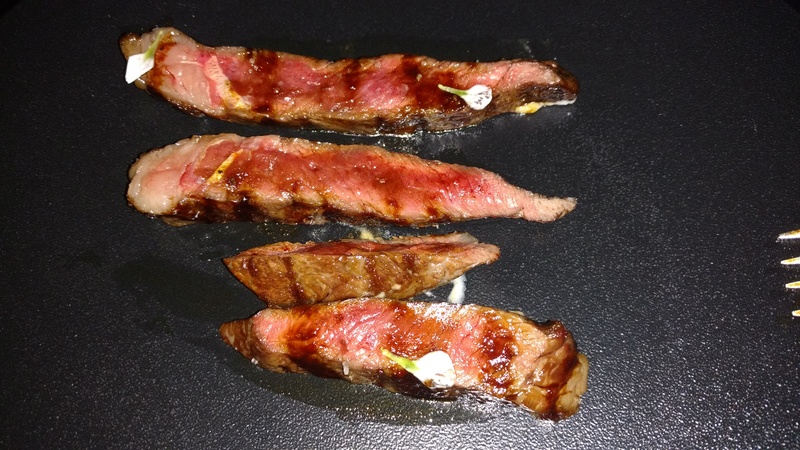 I’ve had plenty of Kobe Beef in Kobe, Japan, and I thought Miguel’s serving was every bit as good (in fact a little tastier) than the super-premium Kobe Beef. 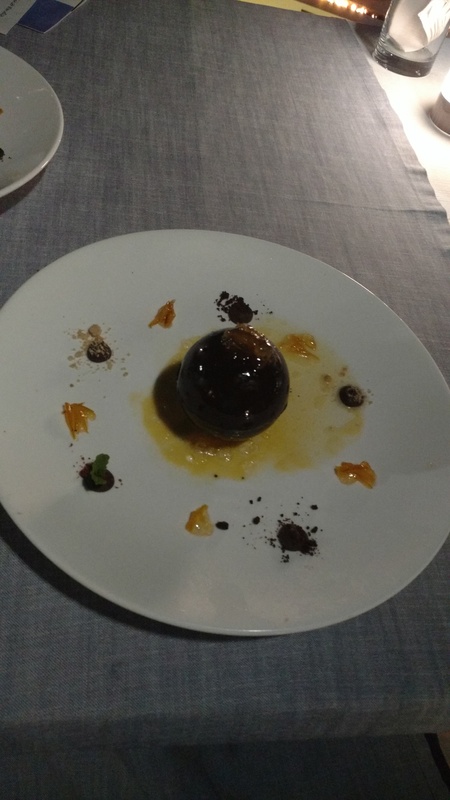 Rather than describing the Creme Brulee dessert, I encourage you to watch the 45-second YouTube video I took while our server Ivan was explaining it. 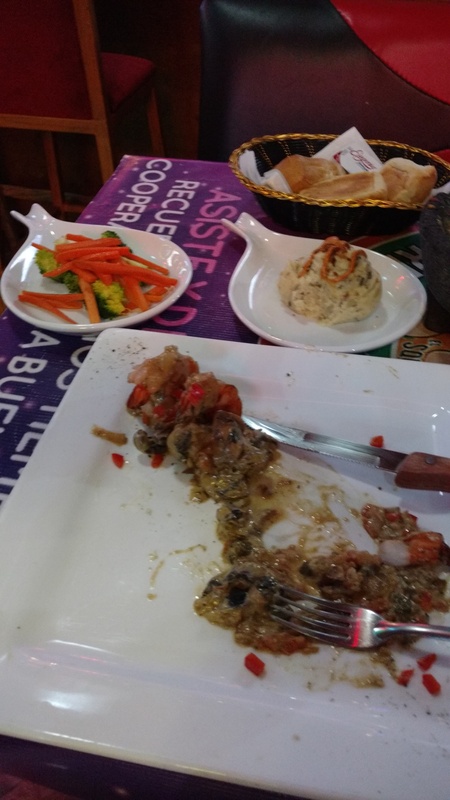 When you come to Los Cabos at the tip of the Baja California peninsula, I want you to come to the CarbόnCabrόn Restaurant and enjoy the magnificent food that Chef Alfonso (“Pancho”) and Sous Chef Daniel lovingly prepare Monday through Saturday. It’s in El Merkado in the Koral Center at KM 24.5 on the Los Cabos Corridor (just south of Pemex). 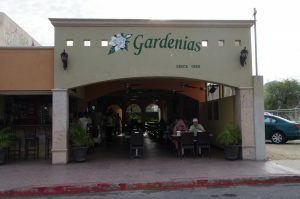 I’d read about Gardenias and so we stopped in there on a Saturday about 5 PM to have some of their tacos. 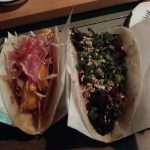 The staff were all super friendly (but not overly so) and the Taco selections were nice. 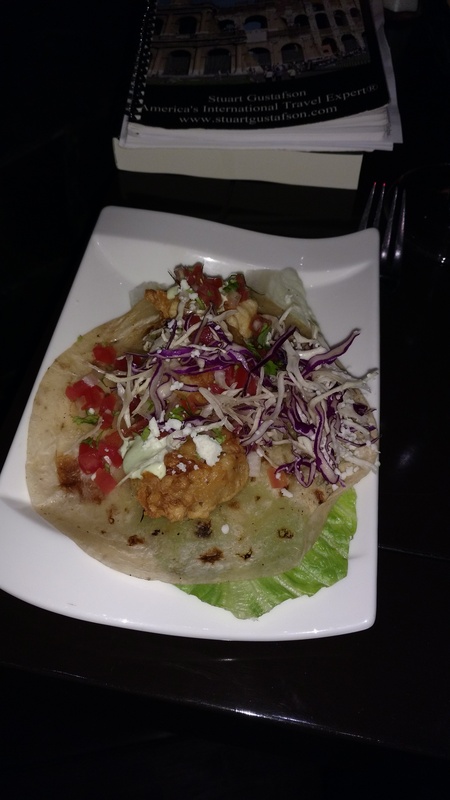 Between the two of us we had one battered shrimp, one grilled shrimp, one fish, one chicken, and one BBQ Beef taco. For the most part, the flavors were very good, and the sauces and add-ons they put on the table were good. 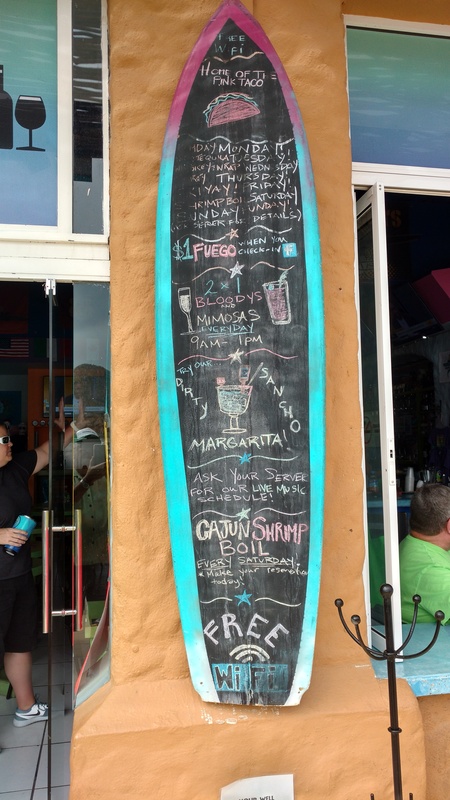 The beer was super cold, and the freshly made margaritas would rate a B+ for flavor. 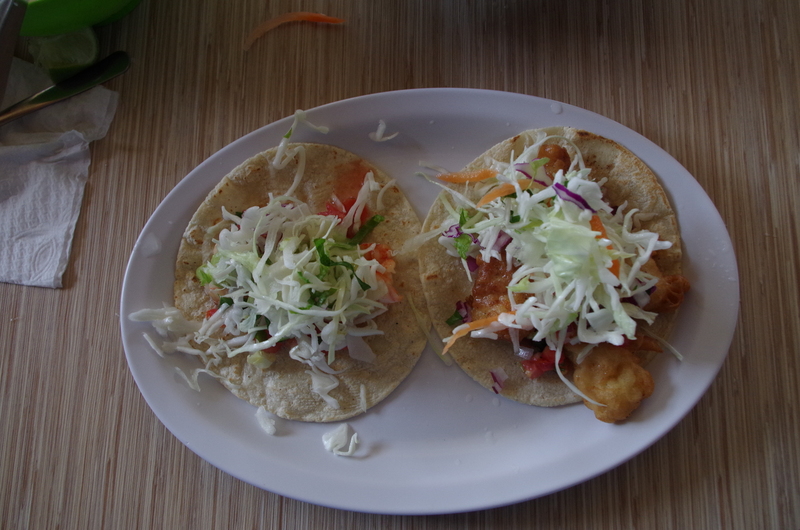 For the five tacos, one beer, and two margaritas — bill was 445 pesos (plus nice tip). So what could be improved? 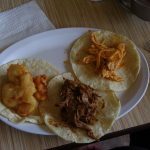 The tacos are served with just one barely cooked corn tortilla. Many other places use two tortillas for ensuring the ingredients don’t break through–perhaps that’s why they give you a fork here! The coleslaw mixture is nice but there wasn’t much flavor to it. I also look at who’s in there; the mixture was about 85% American tourists (like me) and 15% locals. 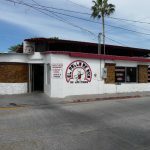 This tells me that the locals know where there are “better” taco joints in the area–it’s time to go searching for them! 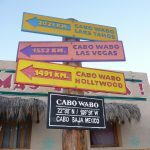 [SPONSORED] Most people who find their way to the Cabo Wabo Cantina in Cabo San Lucas, Mexico, go there for the rock and roll memorabilia, to absorb the music, or to grab their van Halen/Sammy Hagar shirt or hat. 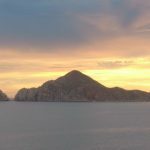 Having been to Cabo every year (sometimes two or three times a year) for the past fifteen years, we’ve had plenty of opportunities to do those things. 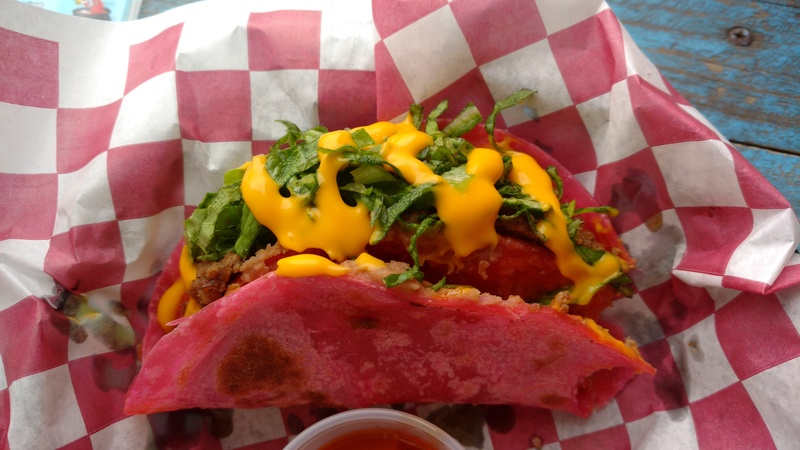 Our visit this time was different–we were on a mission to have their famous Lobster Tacos. We were fortunate to be accompanied at lunch by co-owner Jorge who explained so many things about the restaurant, how it got started, what their long-term mission is (don’t forget that the cantina has been around since 1990! ), and more. Even though it was 1:30 and past the “normal lunch” time, the cantina was hopping with customers, some on their annual week to Cabo, and others enjoying their day off the cruise ship that was anchored in the bay. For an opening cocktail (we had alcohol-free lemonade after this one) we had the signature Cabo Waborita. 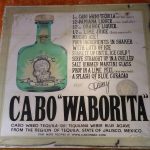 To save time from having to explain to every patron what’s in the Waborita, they decided to just plaster the ingredients on the wall. 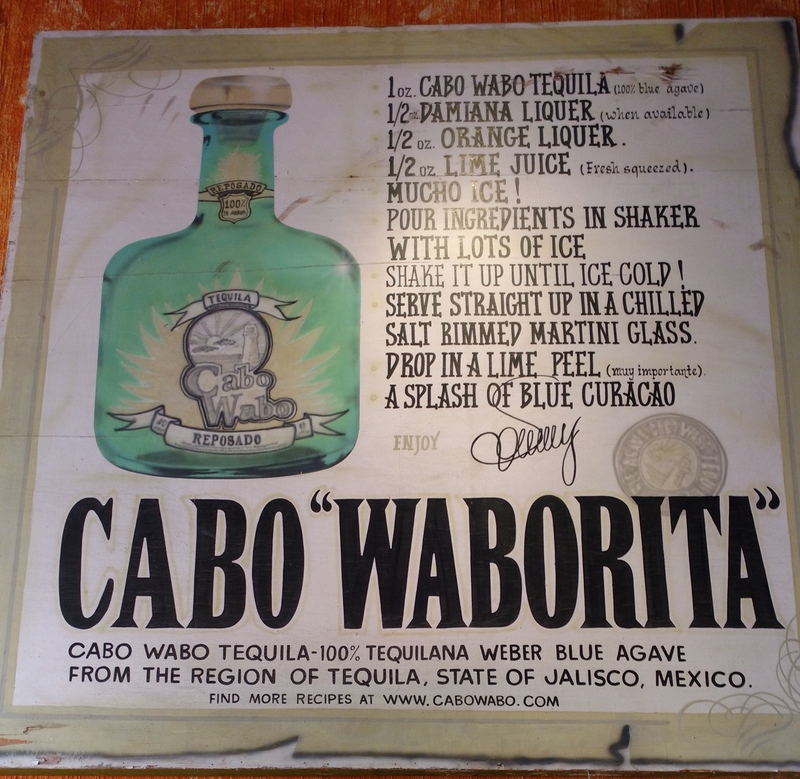 While Jorge is the one who invented the drink, he said that Sammy later wanted to add the Blue Curacao so that the color of the drink matched the color of the Cabo Wabo Tequila bottle–that’s pretty sharp marketing! And then to make it even a little more different than every other Margarita in the world, they did something different with the salt on the rim. Did you notice it? Want to take another look? Rather than salting the entire rim, the salt is strategically placed to look like the shape of a woman’s lipstick imprint on the glass. What do you think of that idea? I think it’s pretty cool. Lunch time! 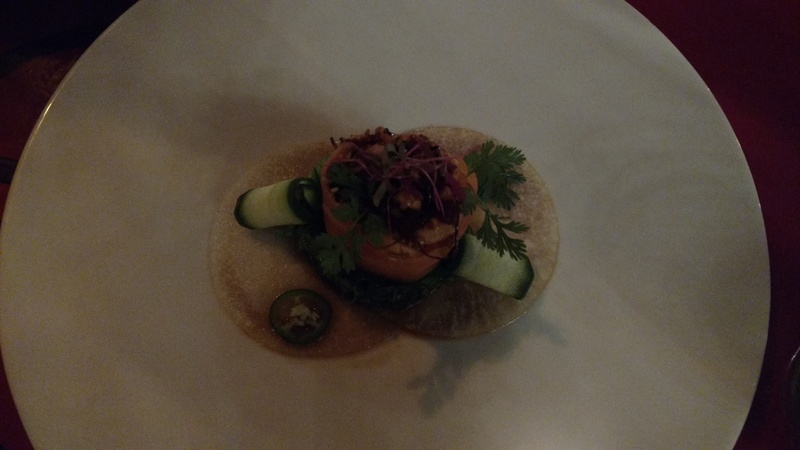 The plate of three Lobster Tacos looked very appealing as it was brought to me. 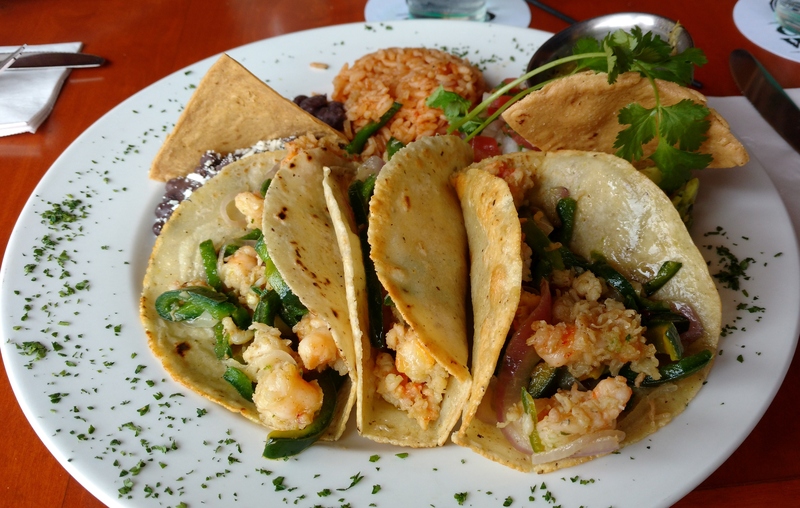 Each taco had plenty of lobster meat, diced green peppers, red onion, and garlic. The picturesque plate also had some Mexican rice, black refried beans, salsa, a guacamole mound, and a few chips. One thing I didn’t know (that’s not the only one) is that the local lobster isn’t in season all year. 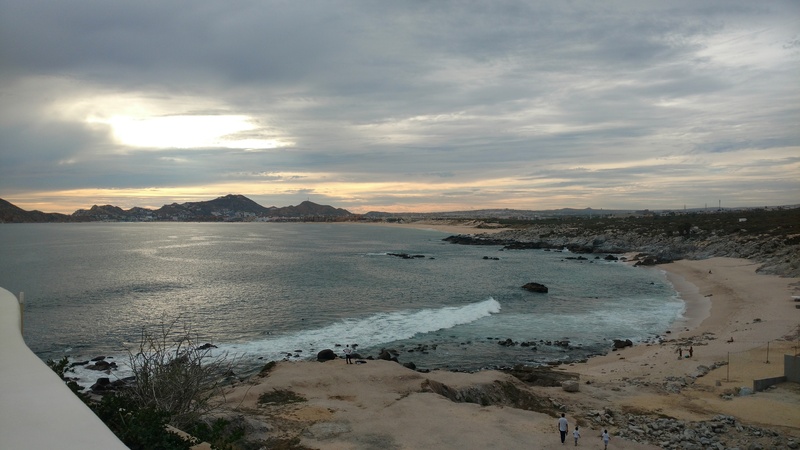 So it turns out that we were quite lucky to be here in Cabo during the right part of the year, not the three months when they don’t have lobster on the menu. Your next question, then, is, “How do the other places have lobster year-round?” My best guess is that they’re either buying frozen lobster or it’s being brought in from somewhere else; it’s just not fresh local lobster. Meanwhile, Jorge saw me eying his Enchiladas Rojas, and he generously shared one with me. The chicken inside was oh-so tender, and the delicious sauce added the perfect touch. 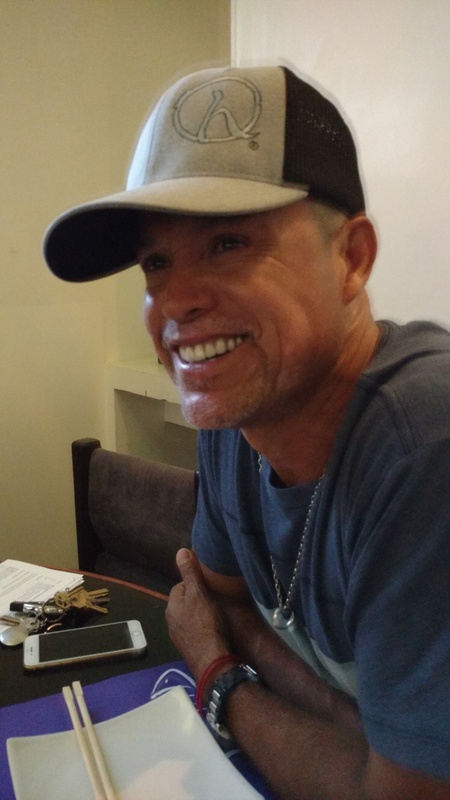 After telling us a little of the history of how he and Sammy got together as business partners, Jorge explained the importance of sustainability of quality ingredients and helping the local economy. 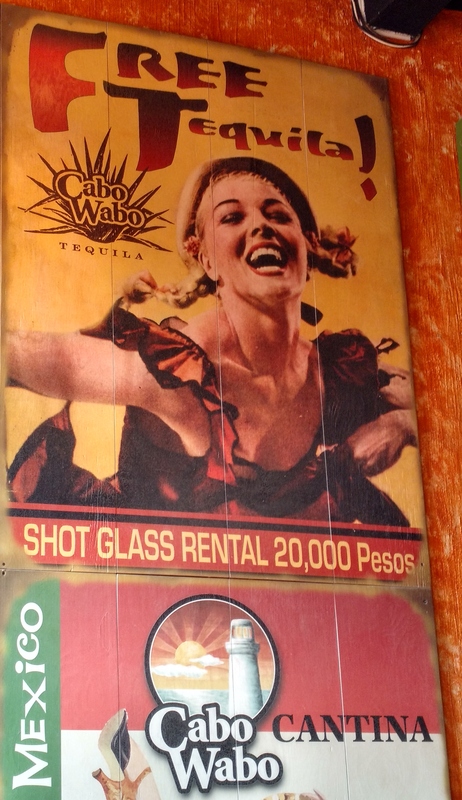 After all, Cabo Wabo is not just a place for Rock and Roll (although it is pretty darn good at that! ); it’s also a place to show how a thriving enterprise can give back to the local area. 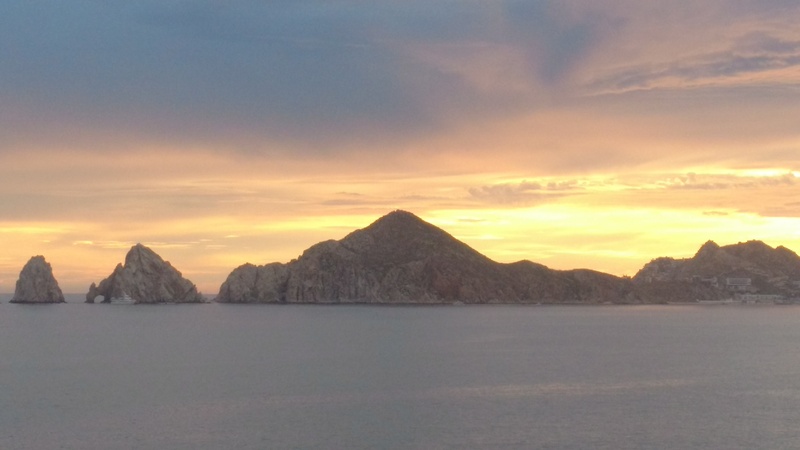 [SPONSORED]We’ve been coming to Los Cabos at the tip of Mexico’s Baja peninsula for fifteen years. 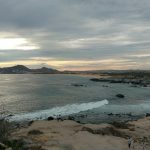 In that time, we’ve spent a fair amount of time in the “smaller a quieter” of the two cities — San Jose del Cabo. 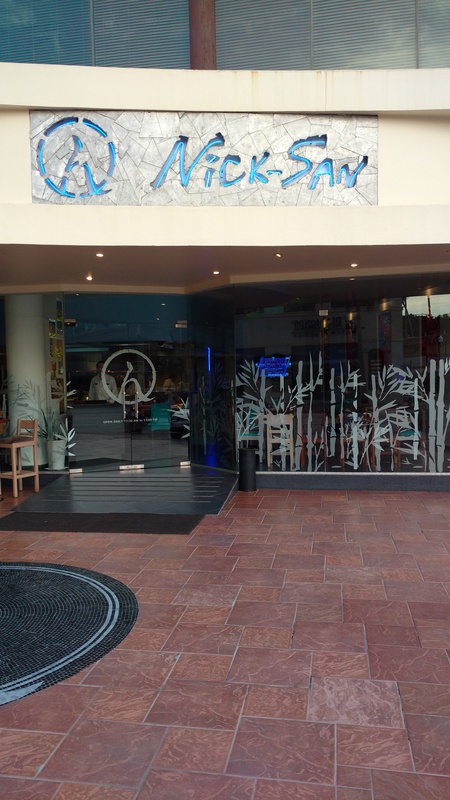 I hate to admit that I’d seen the sign for the Don Sanchez Restaurant as I’d driven on Boulevard Mijares toward the main plaza, but, like many tourists, didn’t go inside. 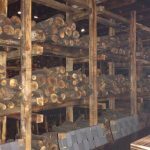 I found out on Sunday night that I SHOULD have gone in there a long time ago; it truly is an amazing gem that’s hidden right in plain sight! We ate in the Hacienda Courtyard, one of Owner/Chef Tadd Chapman’s three venues in this fabulous setting. One of the other two venues that are available is the Guadalupe Terrace (the left photo), a glass-enclosed area with its own private bar with tables for four or eight or any configuration you want. 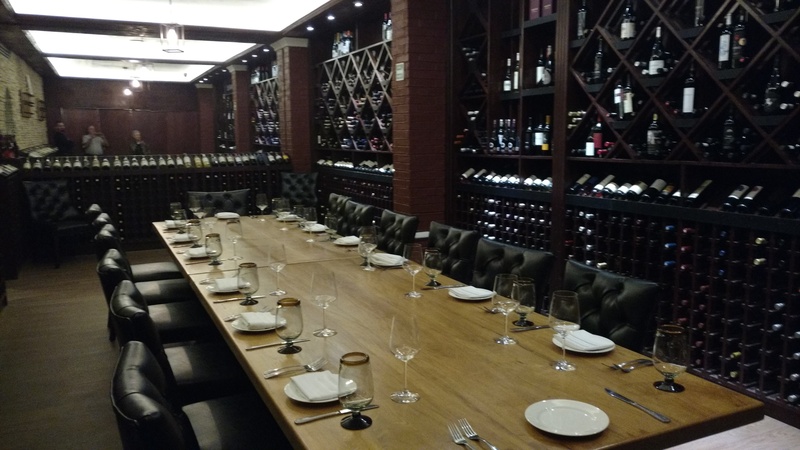 While individuals and couples and small groups may dine here, this is also a perfect setting for a medium-sized group function. This privacy and intimacy here sets you apart from other restaurants. 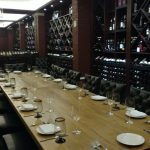 The other dining venue (I’d call it “To Die For”) is The Wine Cellar, their own private cava with over 350 different wines all available for you. 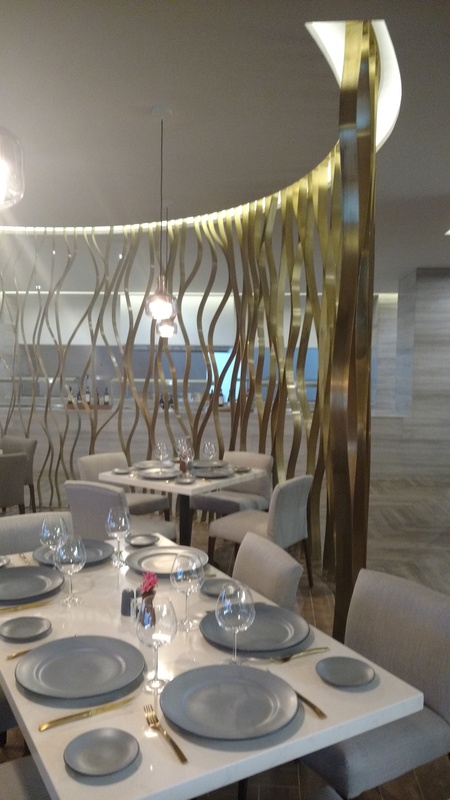 This temperature-controlled enclave is ideal for the experiential diners who appreciate excellence in setting, selection, and service! Speaking of service, with the properly trained and experienced wait staff that is a hallmark in Tadd Chapman’s restaurants, you will not be in need of anything. 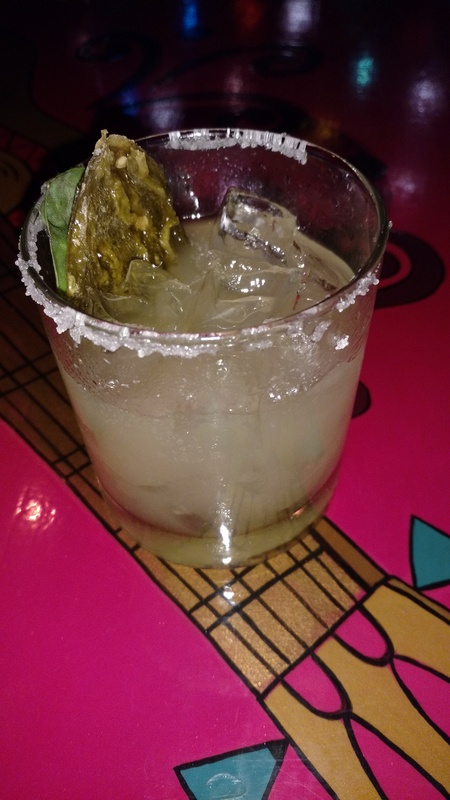 The Jalapeño Margarita was made with Cointreau, Jalapeño-infused Tequila, Lime Juice, garnished with a fresh Basil Leaf and a Carmelized Jalapeño Pepper! 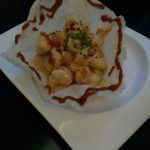 Scallop Esquite: on WonTon skin with scallop, Habanero, Roasted Corn, Shallots, Cotija Cheese. 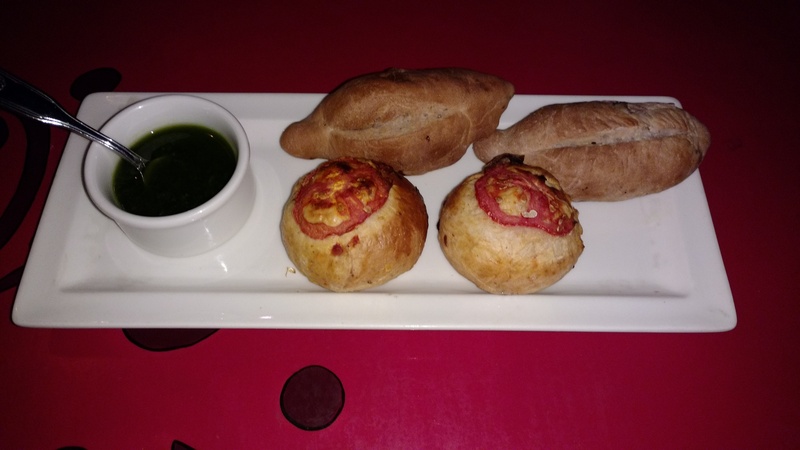 The homemade breads were served with a pesto-oil combination that we drizzled over the warm bread as we enjoyed each appetizer that was paired with the Kim Crawford Sauvignon Blanc wine–it is actually our favorite white wine! Jicama Sashimi was thinly sliced served with fresh fruit (we had papaya; they also use mango in season), spinach, oil, Serrano Pepper slices, and peanuts. 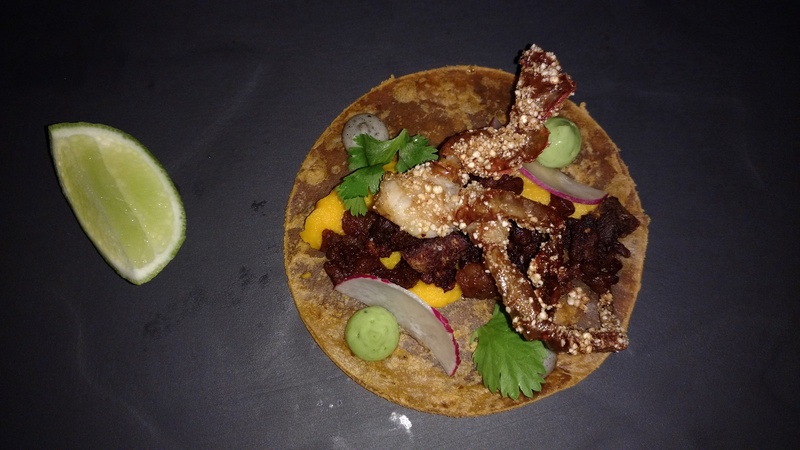 The Mar-Tierra Taco is a combination of crispy beef pieces combined with a fried soft-shell crab accompanied with an avocado mousse. 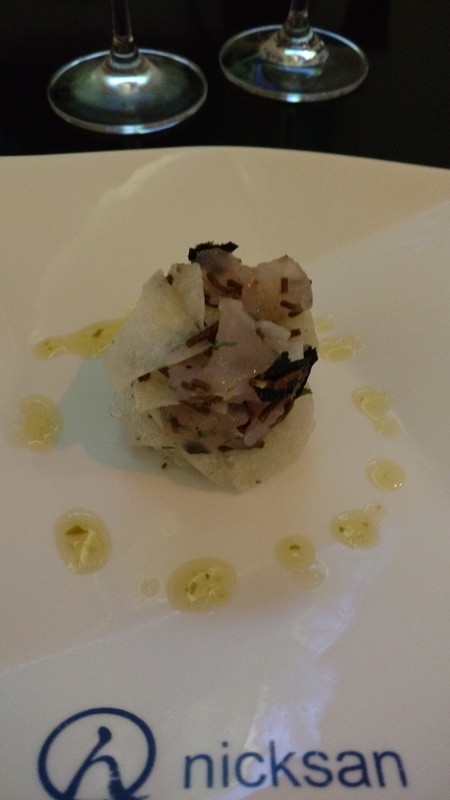 The lemon wedge provided the right amount of acidity to this appetizer. 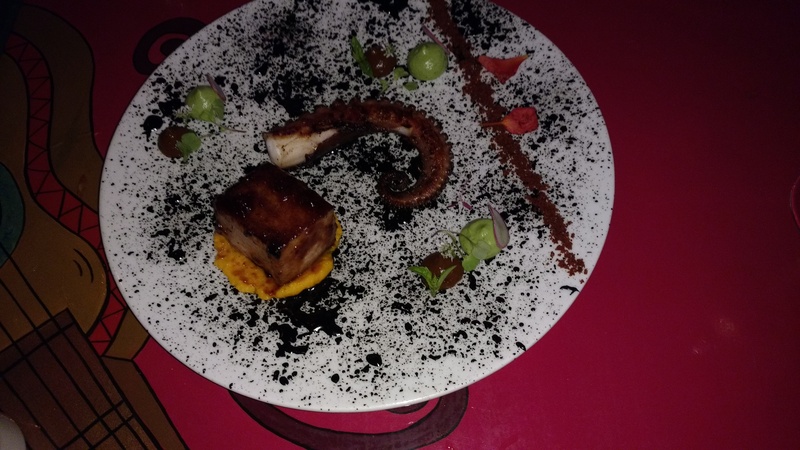 Belly and Suckers is a combination of Pork Belly sitting on a Carob Puree with a grilled octopus; the plate is splattered with squid ink along with a line of broken chorizo and dollops of avocado mousse. 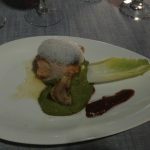 Our first main course was a Beef Tenderloin that was cooked to perfection. I had a Medium-Rare while my wife had Rare. Both of these selections were tasty, tender, juicy, and a perfect match with the Pinot Noir from Portugal that was poured for us. 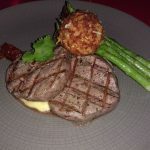 The steak was served with a Hollandaise Sauce, some potatoes, asparagus, and a poached egg that had been dipped in flour and bread crumbs with Parmesan Cheese, and then fried. What a truly unexpected delight! 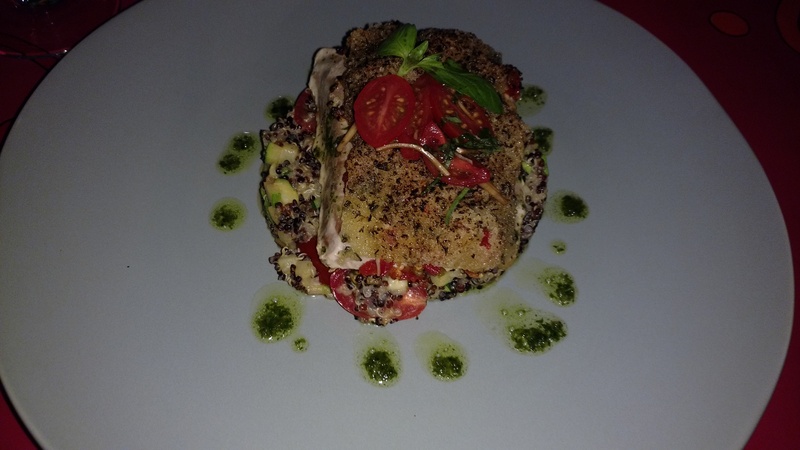 Our final entree, the Catch of the Day, was a coated Yellowtail Tuna sitting on a Quinoa bed. The two entrees made for a very interesting combination. 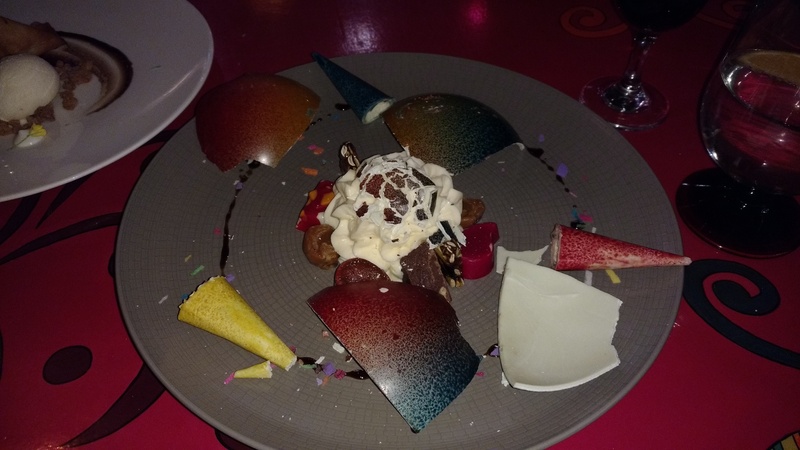 Dessert #1 was a Chef’s Fantasy White Chocolate Piñata stuffed with different types of BonBons. 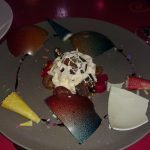 I had to smash it with my spoon and then break up the chocolate pieces so I could mix them with the BonBons. 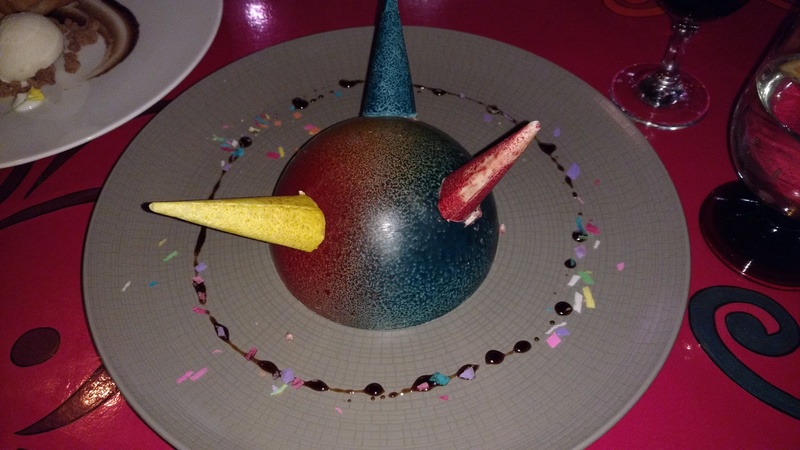 After all that had already been served, it was actually a struggle to consume this creative dish. But there’s more! 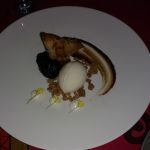 The final dish, accompanied with a nice Madeira Port wine, was a pastry plate with some ice cream and a Fig Compote. 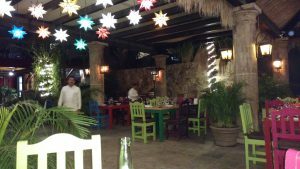 The entire evening at the Don Sanchez Restaurant in San Jose del Cabo was a wonderful experience. The food was A+++, and so was the service from Marcos, Ezequiel, and the others. We also really enjoyed the violin music that added that additional touch of class to the atmosphere. CLICK HERE to view a brief YouTube video (1:38) shot while dining at Don Sanchez Restaurant. We were hungry early on Monday evening so we headed to Pad Thai House thinking it would be empty—it was almost full so early in the evening. All the wait staff looked very friendly and efficient; Caitlyn took care of us with just the proper amount of attention, service, and a smile. 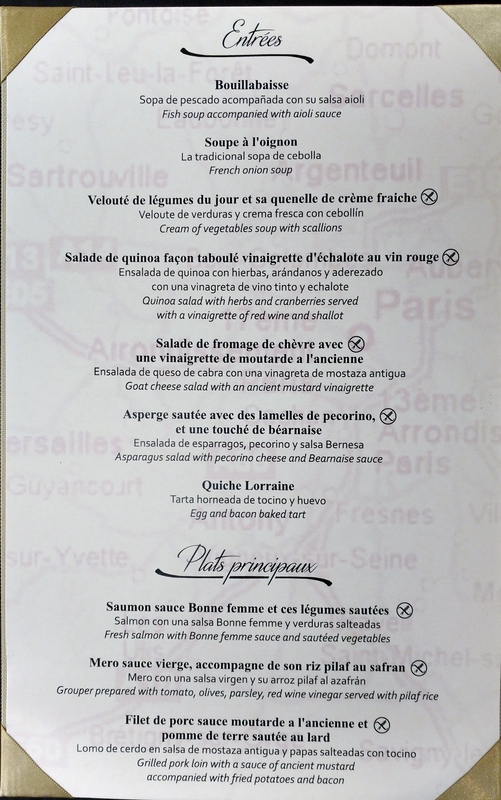 As we looked at the menu it was quite clear that it was going to be difficult to make a decision—it all looked so good! We started with a plate of Chicken Satay with vegetables and Peanut Sauce; the four skewers were ample and tasty. 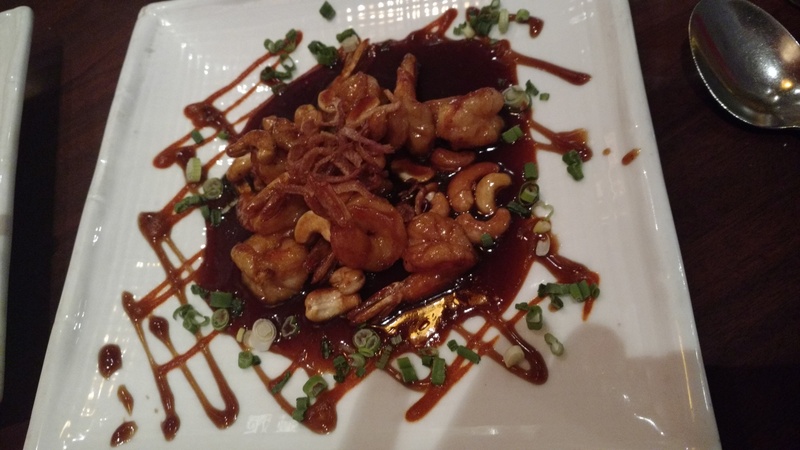 We also had a plate of Tamarind Shrimp—eight tender shrimp in a thick delicious sauce (I almost wanted to lick the plate, but I didn’t!). Then we had the entrees—mine was a Garlic Chicken that I thought could have had more flavor definition, and hers was a spicy Pad Thai, always great! We each walked out with a box of left-overs, knowing that we will be returning here, probably for an evening of appetizers. 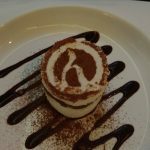 This was a magnificent evening, the food, the service, it was all wonderful, definitely deserving of the 5-star review that I gave it on TripAdvisor. Four of us went to Cottonwood Grille for a birthday dinner. 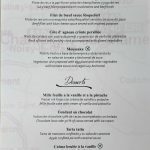 The restaurant was surprisingly busy for a Monday evening (there was one large party in the bar area), but that didn’t diminish the exceptional service that we received. There were three members of the wait staff who worked our table (and others), and all of our interactions were great. The food portions were much larger than I recalled, and the prices were reasonable. We started with a half dozen oysters on the half shell and an order of fried calamari strips. For the main courses, I had the Pork Chops with a nice apple glaze on them; my wife had the lamb shank (HUGE! ); the birthday boy had a seafood linguini (even he couldn’t finish it all), and our daughter order a quesadilla from the bar menu. Each of us took a take-home box so we could continue the enjoyment. For dessert, the four of us split two orders of Chocolate Mousse (we were told each one was enough for two). 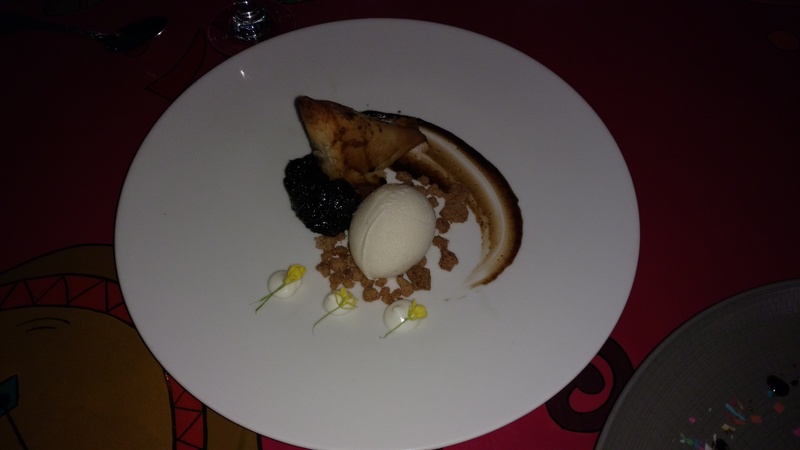 The overall meal and evening — AMAZING! Thank you, Cottonwood Grille for a superb meal, tasteful ambiance, and an impeccable wait staff. [SPONSORED] Restaurants in newly opened hotels and resorts usually are not up to full operational excellence right away. 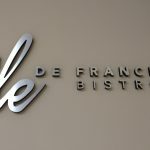 That was clearly not the case when I had dinner at the new Île de France Restaurant that is a celebration of the French ocean liner of the same name. 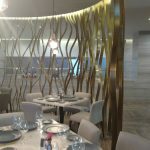 The artistic styling of the decor, highlighted by the floor-to-ceiling “sea wave curves,” combined with the delightful seafood dishes, clearly capture the essence of being on the ocean. 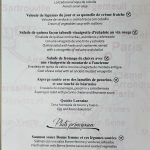 You’re in Mexico, but the food is definitely French! Our Sommelier Wilfredo explained the wines he was bringing out to accompany each course, and his pairing skills were evident with each bottle that he presented. 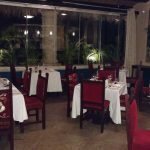 Despite being in a beach resort along the Cancun-Riviera Maya coast, the restaurant enforces its long pants dress code for men in the evening. 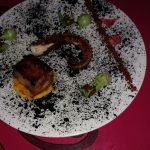 Also no one under the age of twelve is allow in the restaurant in the evening — they want the experience to be truly exquisite, and it was! 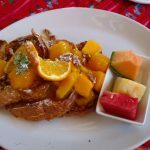 In the morning, everyone is invited to enjoy a delicious buffet breakfast featuring traditional American and Mexican selections. For dinner I started with an Asparagus Salad with Pecorino Cheese topped with a Bernaise Sauce. 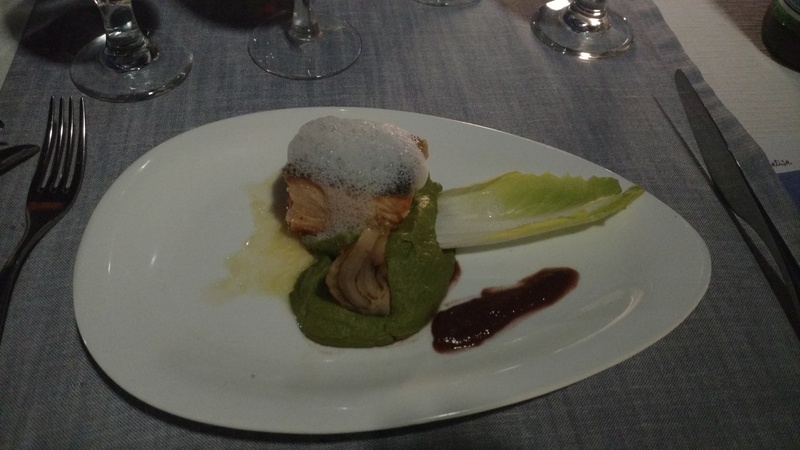 I couldn’t pass up the frash salmon main course, and it was prepared perfectly. 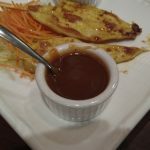 When it came time for dessert, there was no question that I was having the Créme Brulée. Everything was superb, and I expect that this restaurant will soon be receiving major honors and awards. 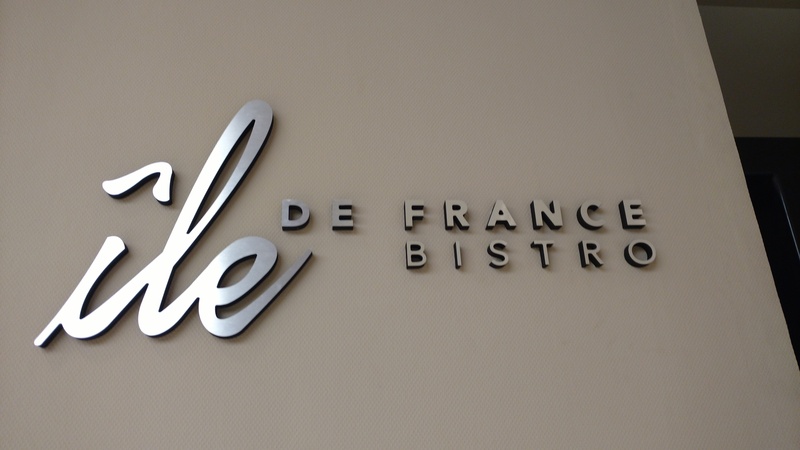 When you stay at Ventus, you MUST dine at Île de France. 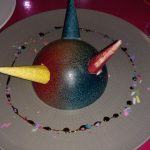 I wish you Bon Appétit! Please see the extensive write-up for Ventus at Marina El Cid Spa & Beach Resort on my FEATURED Experiences page. We were in McCall for a couple days and so we went to the Brewing Company for lunch yesterday. Jon was our server, and we had some laughs over population numbers in Idaho versus other areas and states. Anyway, my wife and I each had the 1/2 pound burger with fries and the fixings. For beer we had their Killowatt Kolsch, probably their lightest beer, but it was good. When you’re in McCall, stop at the burger and beer place that the locals go to — McCall Brewing Company! This wasn’t our first choice for lunch today, but the other restaurant was closed. As it turns out — YEA! The flavors served up here were great. The warm chips and the somewhat spicy salsa were a nice appetizer. My wife then had a HUGE bowl of tortilla soup while I had the #2 Lunch Combination – tostada and enchilada with rice and beans. 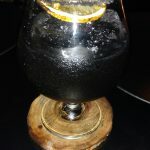 The cold Negra Modelo beer was also super. The service by Lilly was exceptional, and we expect to return when we’re back in town in three weeks! Years ago before moving into its current location (another restaurant was there), El Gallo Giro was in a cramped space in a strip mall. The food was excellent, and you could practically learn Spanish just by listening to everyone in there. I was worried when they moved — bigger isn’t always better — but the many times I’ve been in there, the food is still excellent and quite authentic. 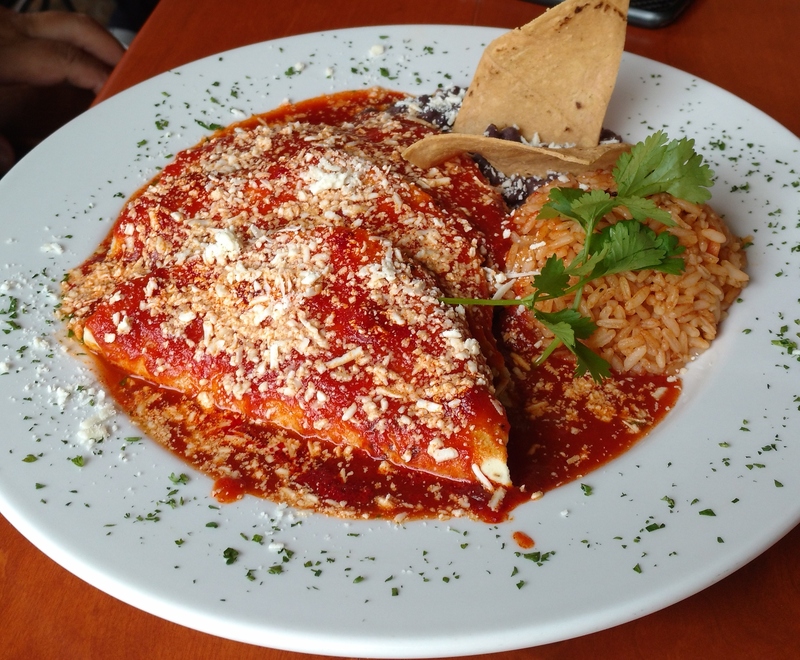 On this past visit I had two Green Enchiladas, and they were very tasty. 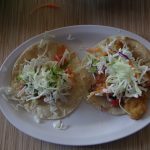 If you want great Mexican food, you MUST go to El Gallo Giro! Tonight was the first Thursday of the month; that meant that many people were downtown celebrating the “First Thursday” activities. Then there’s the ever-present smoke from fires in the area. So . .. . Siam Orchid was not very busy when we arrived for dinner around 7:15 in the evening. The waitress, however, was cheerful and helped us make our decisions on what we wanted to eat. We started with a split Small bowl of Tom-Yum Soup (spicy level 4) — it WAS spicy! I had a Caramelized Ginger dish with Chicken and it was sweet and not very spicy (level 2), and my wife had a spicy level 5 beef dish. We couldn’t eat all of our main dishes so we came home with one mixed box–she’s going to love that lunch! The service was great tonight, and so was the food! It’s nice to have a good Thai restaurant so close to our house — we’ll be back again! 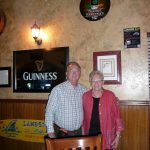 Today would have been my Mom’s 100th birthday, and so my wife and I went out to celebrate it with food that she liked once she moved to Boise. We chose Pho Nouveau because of its convenient downtown location and a recommendation from friends. Blake was our server and he was super attentive as we sat outside to enjoy the nice weather and the ambience of the passersby and street music. The only negative to sitting outside was the flies that also wanted to enjoy our meal — they weren’t terrible, but we might choose to sit inside the next time. 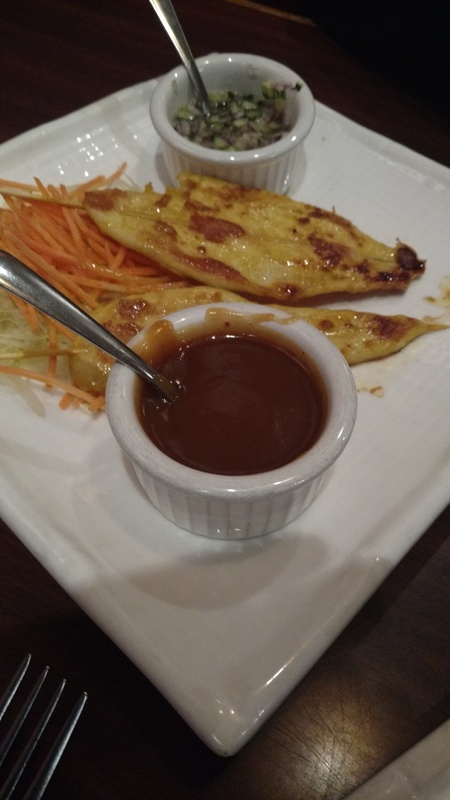 We started with an appetizer plate of the crispy spring rolls and dipping sauce. They were great; fried just right and very flavorful. My wife then had a Spicy Pho bowl that was enough for a second meal here at home. I had the Spicy Beef and Shrimp with Jasmine Rice and Cucumber Salad — it was so good that there was none left on the plate. 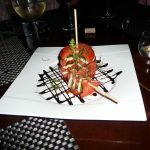 There are many restaurant choices in Boise, whether you’re looking for a particular cuisine or location. I was very happy with our meal and service at Pho Nouveau tonight — thanks to Blake, I’m sure we’ll be returning! 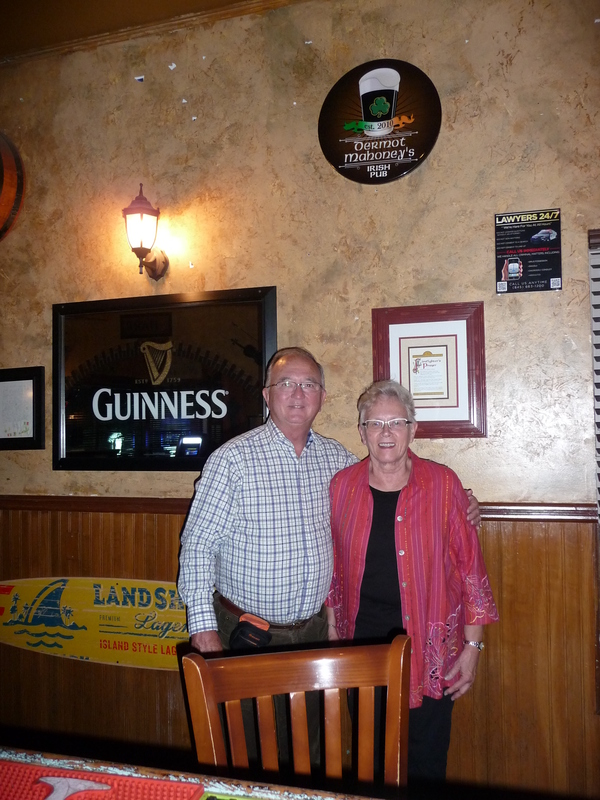 We like to go to Irish Pubs for their hospitality, food, and drinks. 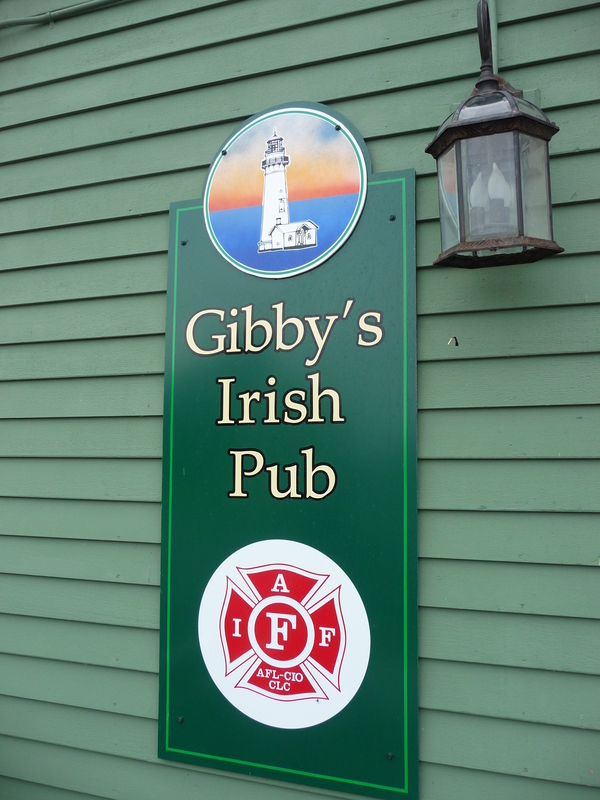 This place surfaced when I did a search for Irish pubs on Mackinac Island. We went there after doing some walking around, but it really isn’t an Irish pub. 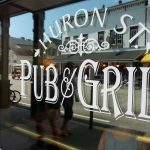 It is a pub-like establishment, with standard bar food (but not pub food). 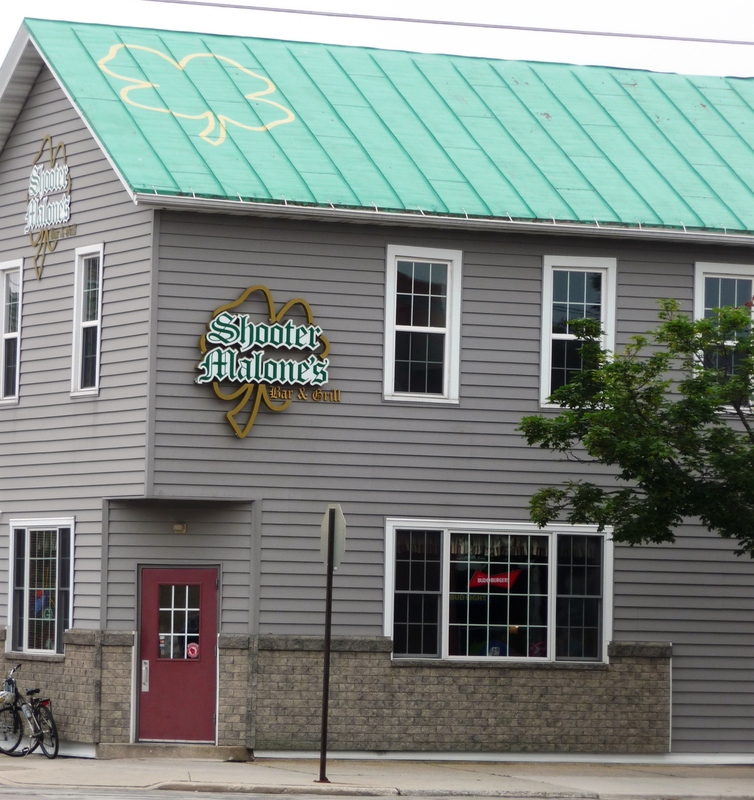 The staff were friendly, an they were cleaning the floors from the messy children who were there, so it wasn’t a bad place — it just wasn’t an Irish pub! 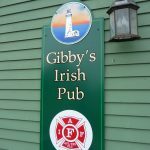 Our cruise boat was docked on the opposite of the river, so it was quite the walk for us, but we made it over to Gibby’s Irish Pub. 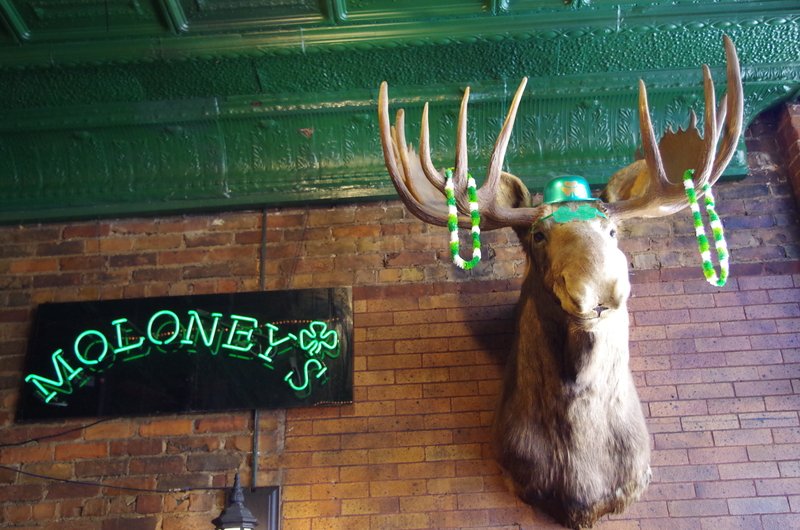 We like Irish pubs, so we were willing to make the sacrifice on a warm day. We were rewarded with a couple cold beers — Guinness and Stella Artois are our typical drinks in the pubs. The staff were friendly, and the local were a bit interesting! We were given recommendations for other places to drop in, but we skipped them on our way back to the boat. 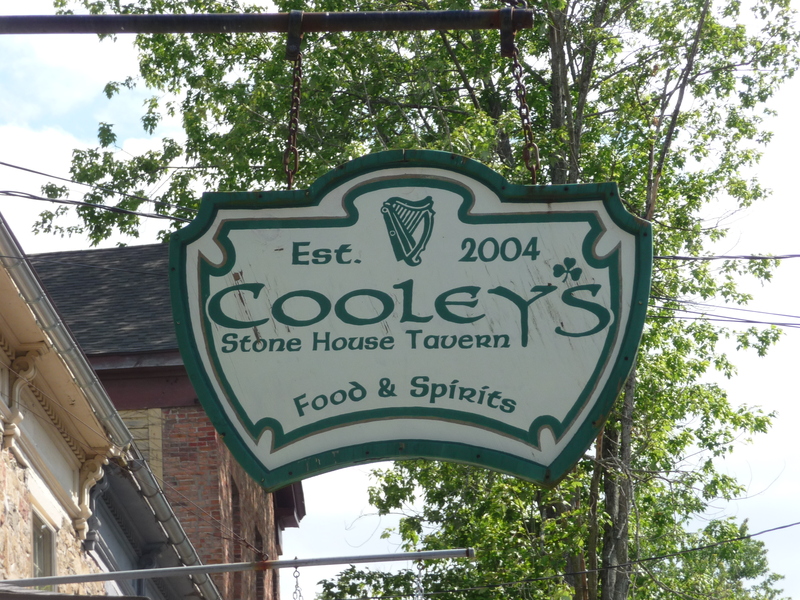 I’d already been inside the baseball Hall of Fame in Cooperstown, and my wife wasn’t that interested, so we walked an additional 500 feet (per Google) to the closest Irish pub — Cooley’s. 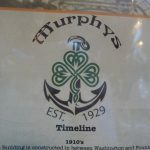 The people inside (the wait staff and the regulars) were all very friendly, and so we toiled away our time having a cold beer — Guinness and Stella Artois. The only problem here were the touristy adults who let their kids run around crazy (and unsupervised) while they ate and drank. But that wasn’t the fault of the pub. Our boat tour up the Hudson River (and beyond) stopped in Kingston for the evening. 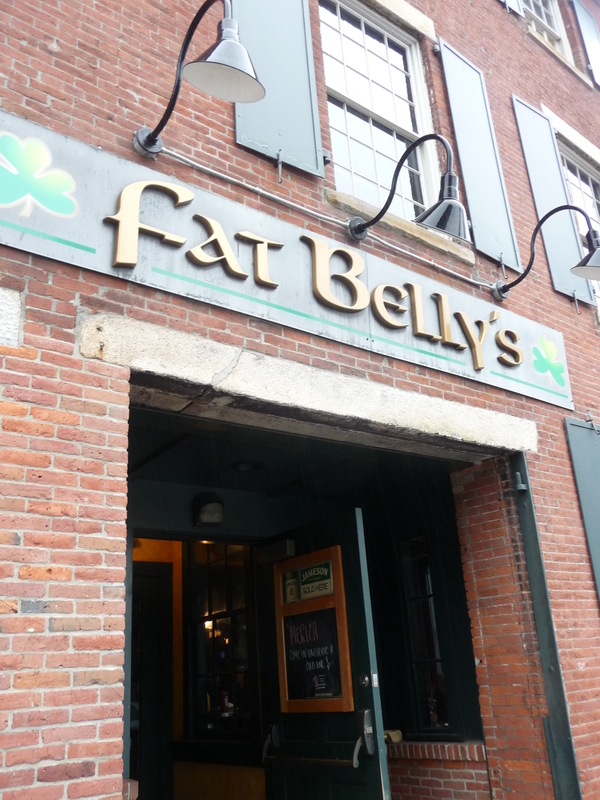 We walked into town and found an Irish Pub — our favorite places to visit. 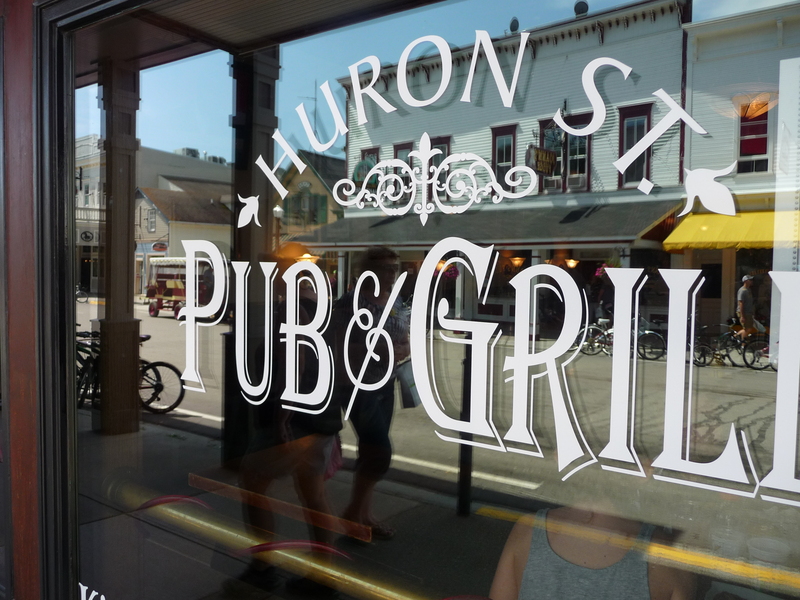 The pub was open on Sunday evening — a pleasant surprise for us. We enjoyed a bite to eat and a couple beers. I gave it 5 stars because they were open when most places are closed, and they were extremely friendly!! 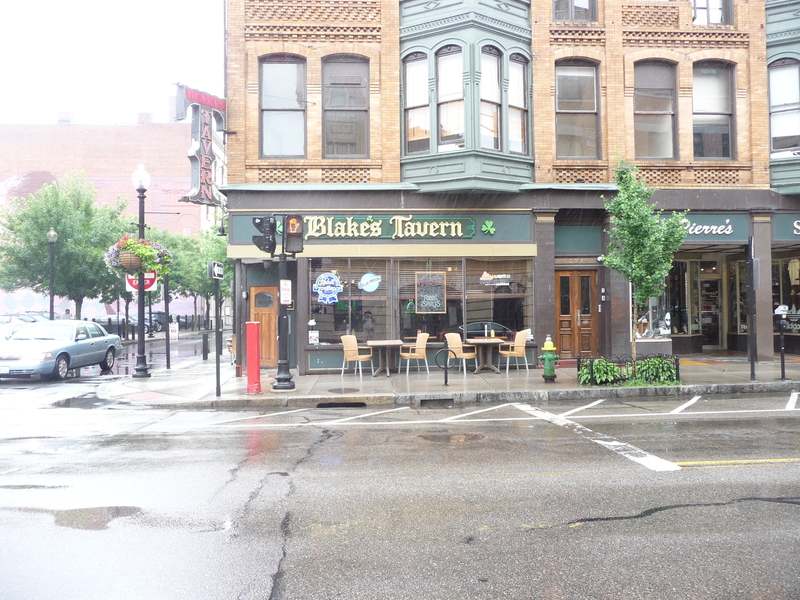 Blake’s Tavern was our final stop on our Friday pub crawl in Providence. The rain was slowing down, but it was still nice to be inside where it was dry. In addition to our normal beers (Guinness and Stella Artois), we had an order of onion rings, and they were very good. The bar server was friendly, but not overly so where we felt we had to entertain her! 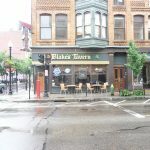 We continued our pub crawl on a rainy July Friday in Providence as we went to Murphy’s Pub. In addition to our beers (Guinness and Stella Artois), my wife bought a pub shirt that she really likes. The staff were friendly and were able to politely work with a young couple that had already had too much to drink. 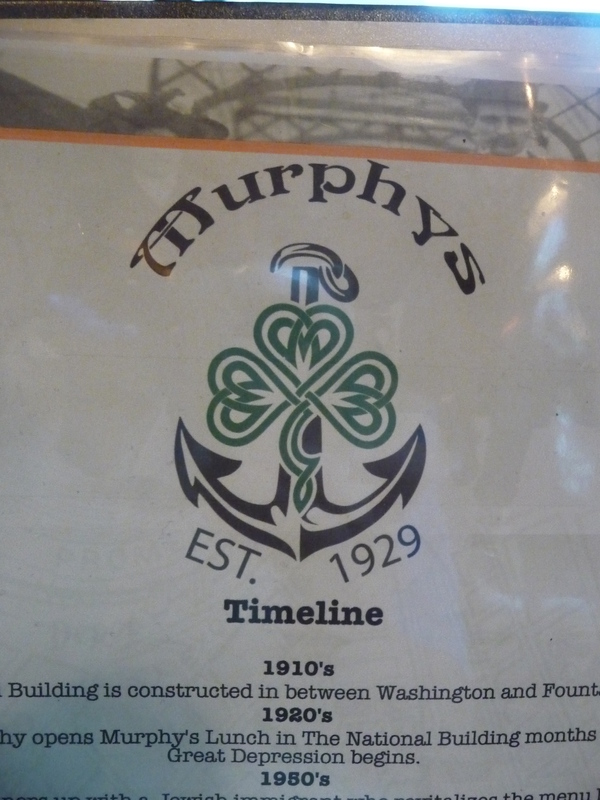 We liked Murphy’s, and we’d consider returning should we come back to Providence. 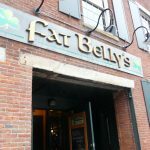 We stopped in Fat Belly’s Pub as we were strolling along the canal area east of downtown Providence. Franklin was our friendly server and we each enjoy a nice cold beer (or two!). It was a drizzly weekday so there weren’t many customers inside, but the atmosphere was still very nice. It looks like the place would really be fun on a packed evening! 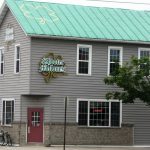 We stopped in Shooter Malone’s for a bite to eat, a cold beer, and to watch the British Open golf tournament! 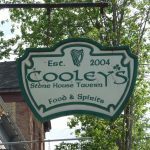 We enjoyed cold Stella Artois on draught, and we split a plate of cod fish and chips with a side of cole slaw. They had the golf on a couple of the televisions, so it made for a great couple hours eating and watching. the staff were very friendly and it was a good atmosphere! We went on a late Sunday afternoon, the place was under a quarter full — table right away and super fast and friendly service. We started with a Wasabi Shumai starter (dumplings with shrimp); wife also had spicy miso soup, and then we split two rolls — Crunch and Cream and a Summer roll. 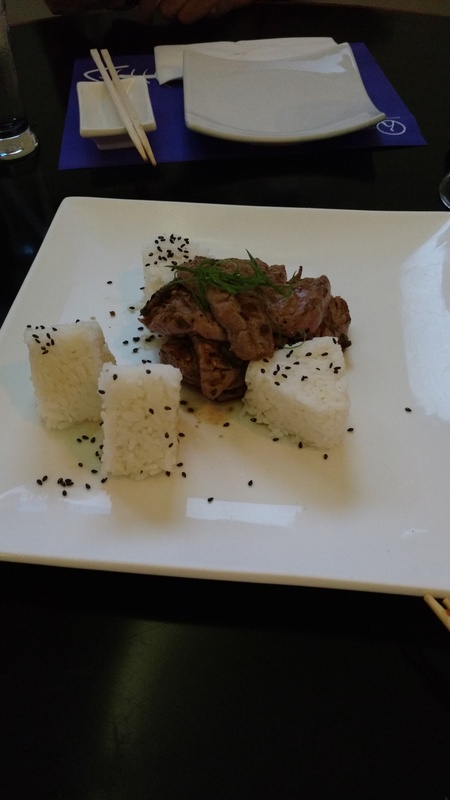 All the flavors were great; we weren’t rushed, and it was a very enjoyable meal. I’d go back any time I’m in town! Our cruise ship tour included the amazing luncheon buffet at the Grand Hotel. We arrived at the hotel a few minutes before noon so we had time to wander around through the hotel lobby area and shops. One treat was listening to some vocal solos by a group of talented musicians. Then we went into the buffet area where there were numerous long tables of all sorts of salads, meats, cheeses, tasty delicacies and desserts. The well-dressed staff were very polite in serving us complimentary beverages and attending to our every desire. This is truly a once-in-a-lifetime experience! 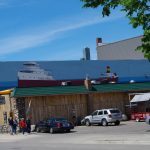 Our ship docked in Sault Ste. Marie and I went for a walk in town rather than go on an organized tour. 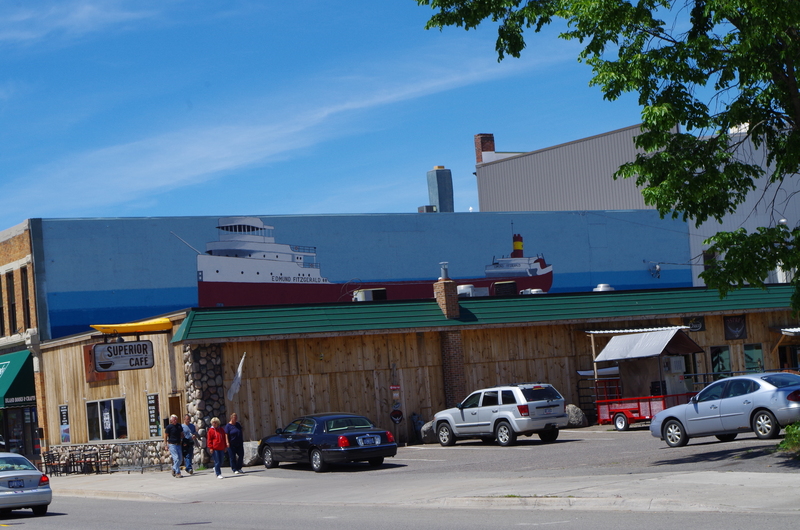 As I went down Portage Avenue, I couldn’t help but see the huge mural of the freighter Edmund Fitzgerald on the side of the Superior Cafe. I’d already eaten so I wasn’t hungry, but the look inside indicated that this would be a nice friendly place for a casual meal. Perhaps on the next trip . . .
Our cruise ship stopped in Sault Ste. Marie for about a half day. Rather than going on one of the organized tours, I decided to stroll around the town. 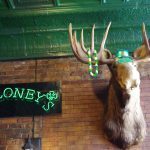 I was pleasantly surprised when I came upon Moloney’s Pub as we like to visit Irish pubs no matter where we are in the world. The rock ‘n roll music was playing, but it wasn’t overly loud. The squares in the stamped steel ceiling were a throwback to ages gone by. They had 20 Michigan beers on tap, and I opted for a glass of Raise the Roof lager with a sub-average 4.9% alcohol content. Families are certainly welcomed in here, and the friendly staff treated me like a local. The visual most people have of various “Mongolian BBQ” restaurants is raw food spilling off the services tables, overstuffed people in chairs, and noisy wait staff chatting in another language. Our visit to this particular restaurant gave us a different picture. The food set up was neatly in place, and the preparation bowls were properly sized to give each patron a fair serving size without having to smash all the items down into the bowl. Three of us went for lunch last Thursday: prices for lunch are $6.99 for a small bowl, $7.99 for medium (two of us had that size), and $10.45 for a huge bowl (not for us!). Dinner prices are a bit higher as is the norm in most places. The restaurant was clean and the hostess was always doing some tidying up work when she wasn’t seating new customers, writing up their bills, etc. We were pleased with our experience, and we’d gladly go back the next time we’re there for another movie outing. We were meeting my brother and his wife in Burns (a halfway meeting point, albeit 180 miles from home! 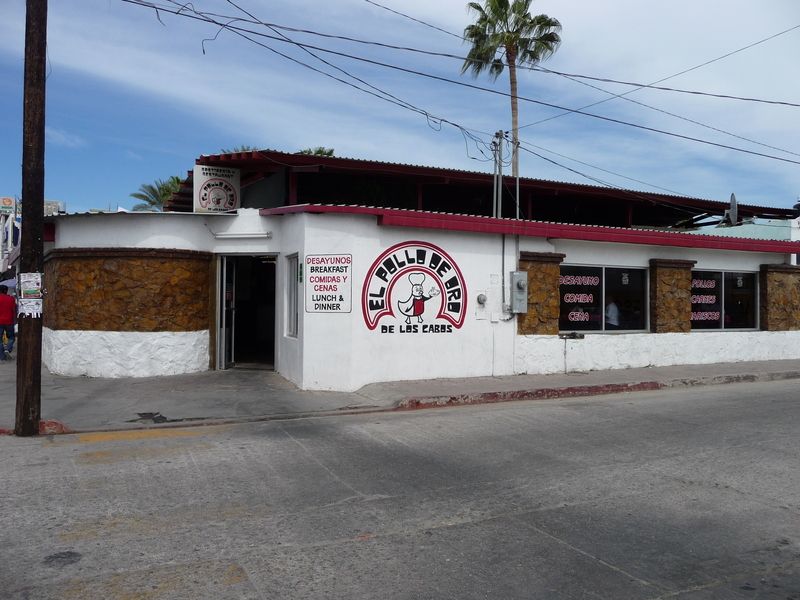 ), and we looked at a few restaurants before deciding on El Toreo. We talked with a few people entering (and leaving), and they all said it was excellent food! And they were right. Four of us had great luncheon plates, and the service was also very good. I told our waitress to thank the people who suggested we eat there, and she smiled! I told our tour group about the great coffee on the corner (Cabo Coffee), and four of them headed over there almost every morning. They were delighted that it opens at 6 AM EVERY day, and the delicious coffee was an awesome start to their day. Don’t forget to ask for a punch card when you’re there — get the 10th cup free after nine punches!! 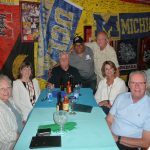 Friday night was the last evening for our tour group in Cabo San Lucas. 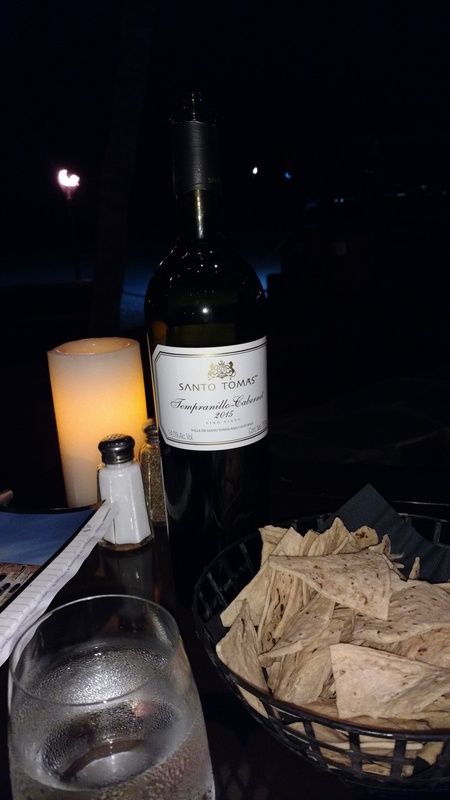 We went to Cabo Wine & Jazz Club upon the recommendation of a trusted source, and it was a good choice. The six of us shared several bottles of wine as we listened to Daline Jones sing and Diego Ramirez play the piano. The music was quite delightful, and it was a great way to end the trip. The service wasn’t the fastest, but we weren’t in a rush, and we weren’t keeping others from entering. Our group of six stopped in El Toro Guero for a [very] late lunch before the Art Walk on Thursday. I was hoping it would be open at that time (3:00), and when I got there, my hopes changed to hoping there was an open table — it was packed! It was a new experience for four, and they loved it! 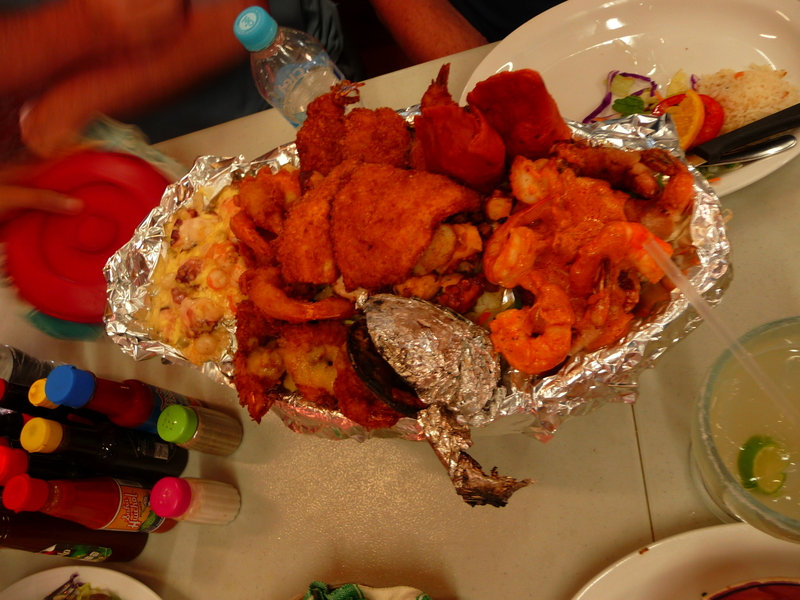 We ordered a seafood platter for four that easily fed at least five of us. The margaritas were very good as was the prompt service. 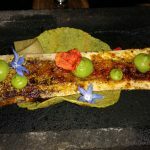 One of the reasons I love going here is that I see so many locals eating there, a sure sign of excellent food at a good value! Six of us stopped in for lunch and we loved it. 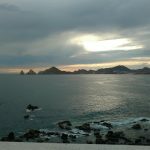 My wife and I had been there before, but the others were in Cabo for the first time. Two had hamburgers, two of us had tortas, and the other two had a smoothie. All in all, we enjoyed our meals. WARNING — the tortas are amazingly huge; I had to take half of mine home with me. 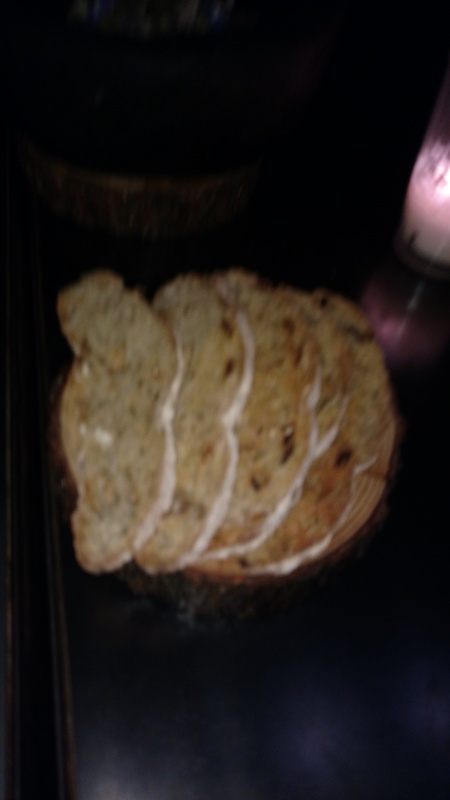 The bread is delicious, and the fillings are quite ample. My wife loves the smoothies there and she had a “New York” made with milk. The service isn’t the fastest, but they are making each item individually as you order it, so you know it’s fresh and tasty!!! It’s right on the main drag, one block from Cabo Wabo, closed on Sunday (that’s good!). Sure, it’s touristy to eat at tables in the sand at The Office, where the waves come right up to the first row of tables. 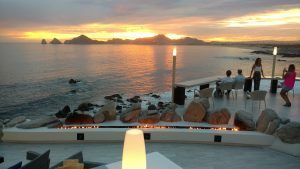 But it’s still a fun place to go, especially taking “first-timers to Cabo.” Hey, the locals go there, so you know it has to be good! The Mimosas were a hit as were the eggs with shrimp. We enjoy the valet parking as we wouldn’t know where to find a parking spot in the busy beach area. The service was fast, and the breakfast coffee was hot and plentiful. 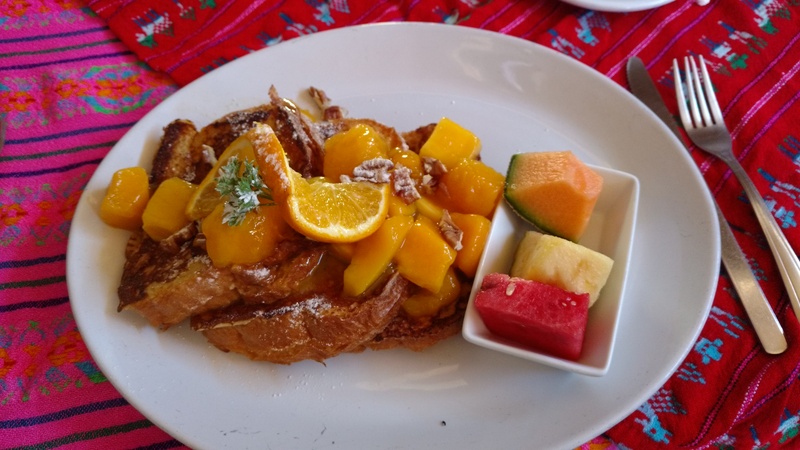 Six of us ate breakfast at Mama’s twice on our week-long stay here in Cabo. Both times we found the food to be very good, and the service was okay. Are they the fastest service in town? No, but is that why you’re in Cabo? The portions are large, flavorful, and tasty. enjoyed our meals there, and we’d go again, but we’re leaving tomorrow. 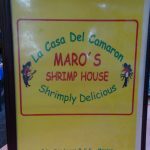 I was asked recently by a traveler on our small-group tour how many times I’ve been to Maro’s. I said, “About twenty times, maybe more.” There were about forty people waiting outside; I went in and Maro said, “How Many? Bring them in.” The traveler asked because when we went in, we were warmly greeted by Maro with big hugs, and the service — as usual — was fantastic. (Actually it was the third time this year, and it’s only May!) 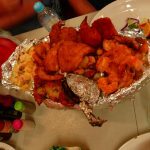 We all had the quarter kilo of broiled lobster and grilled shrimp — tasty! 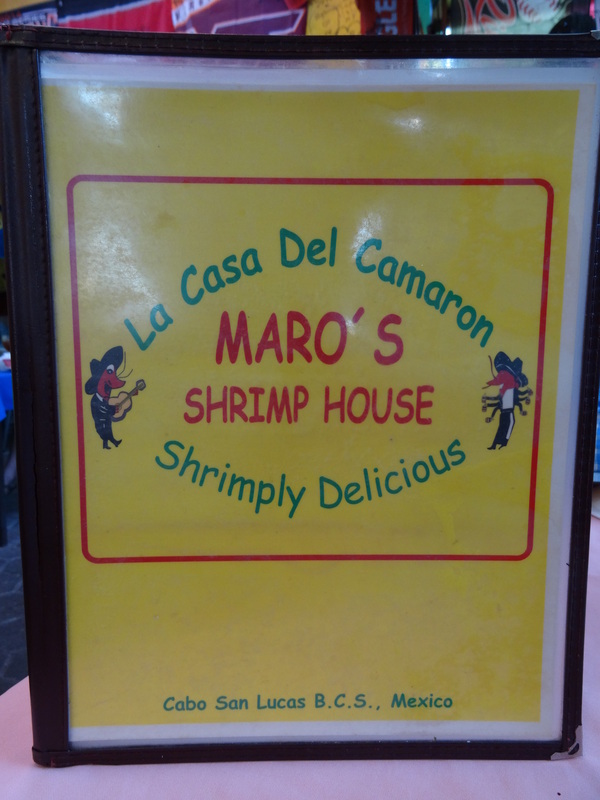 Maro hasn’t raised his prices in ten years, just one of the reasons there’s a line waiting to get in while other restaurants are virtually empty. Six of us went to La Dolce for dinner on Monday night. Every night is a busy night for some restaurants (and some are never busy), and that was the case with La Dolce. But they made room for us, and we enjoyed a delicious meal. Four had pasta; one had pizza, and one had a large salad. They were all good as was the nice Chianti wine. We appreciated that they made room for us, and treated us like family! 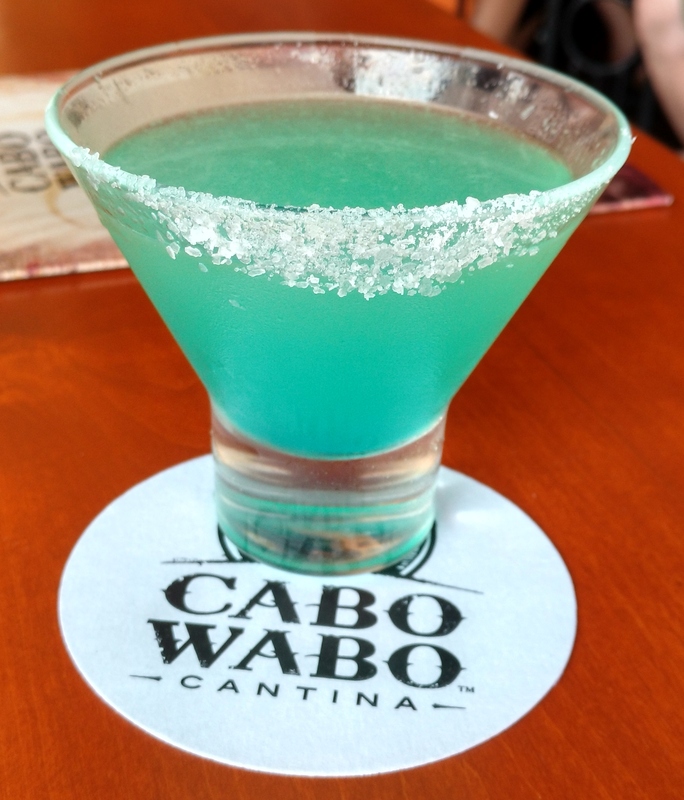 Our small-group tour went to Cabo Wabo for a cocktail before dinner. Two had Pina Colada, two had Waborita, and two had beer. The drinks were pretty good, although they are not inexpensive. That is probably why we saw most people come in, have one, and then leave. 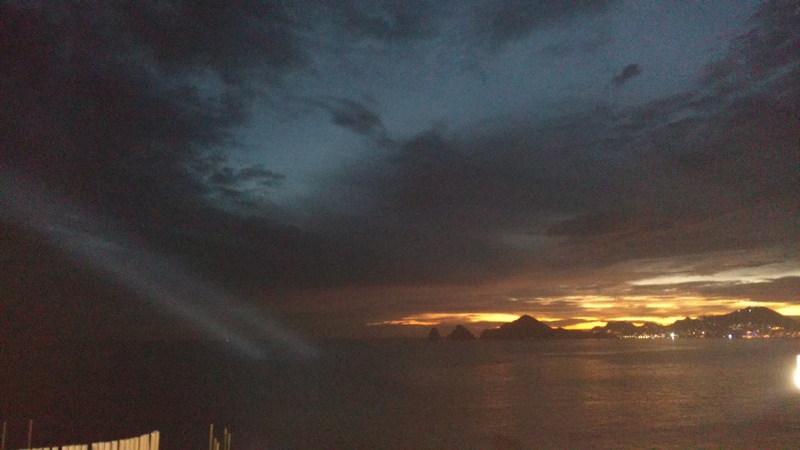 But it was a check box item for most people in the group who’d never been to Cabo, so we had a good time. 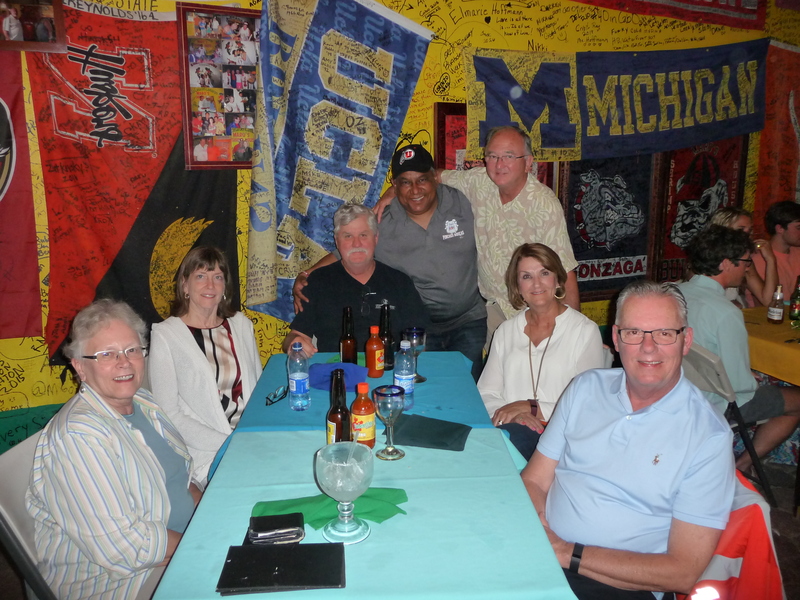 Our small-group tour of six started the week of fun with dinner at Captain Tony’s last night. 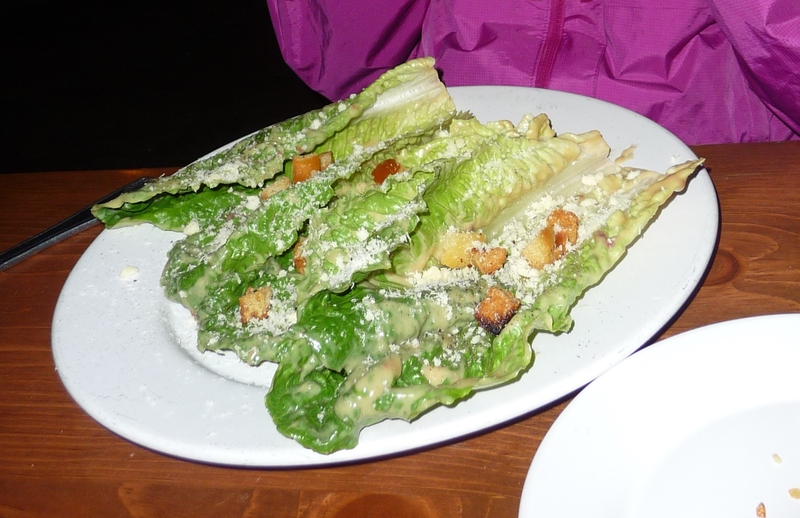 We each ordered a salad plus an entree, but the ladies were smart and selected an appetizer for their entrees. The salads come in a large soup bowl and could almost be a meal in themselves. Pablo made the Caesar Salad table side and it was quite the show. The fish was absolutely delicious (I had mine grilled with a garlic butter sauce); the drinks were great, and the service was spot-on. We’ve eaten there before, and so I knew I could trust them to make another tasty and delightful meal. We’ve been here many times, and we came back for our first meal in town. 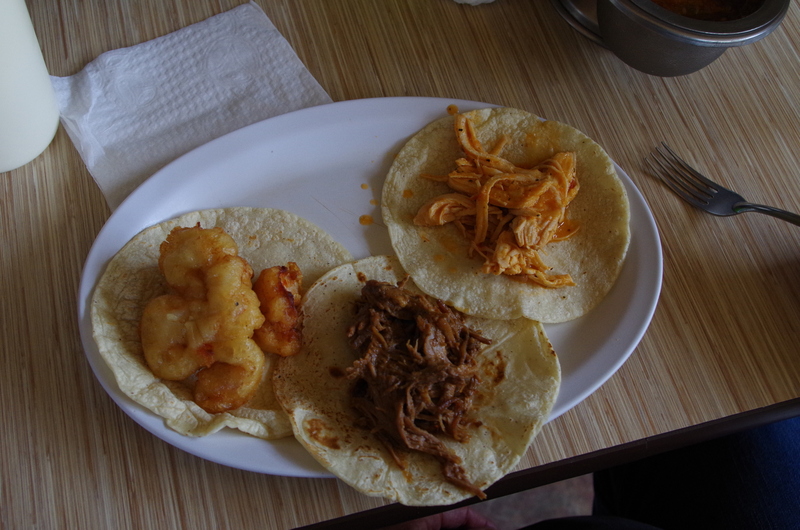 We had the four tacos and a beer for $7 (125 pesos). My wife had two chicken and two battered fish, and I had one of each (beef, chicken, pastor, fish). 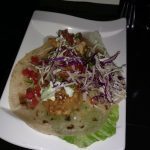 The tacos are on a small tortilla, but the filling is a nice portion, and then you top it off at their extensive Salsa Bar. We had a cold Dos Equis to go with the tacos — ymmm! We’ll go again — good food and really awesome pricing! Four of us went to Fujiyama (again!) for a birthday dinner. They serve a complimentary bowl of hot edamame before you order anything else. Then after the dinner, they bring a “shot” of cool, sweet plum wine. All complimentary! Three of us had some nice sushi rolls, one had a shrimp and vegetable tempura dinner. 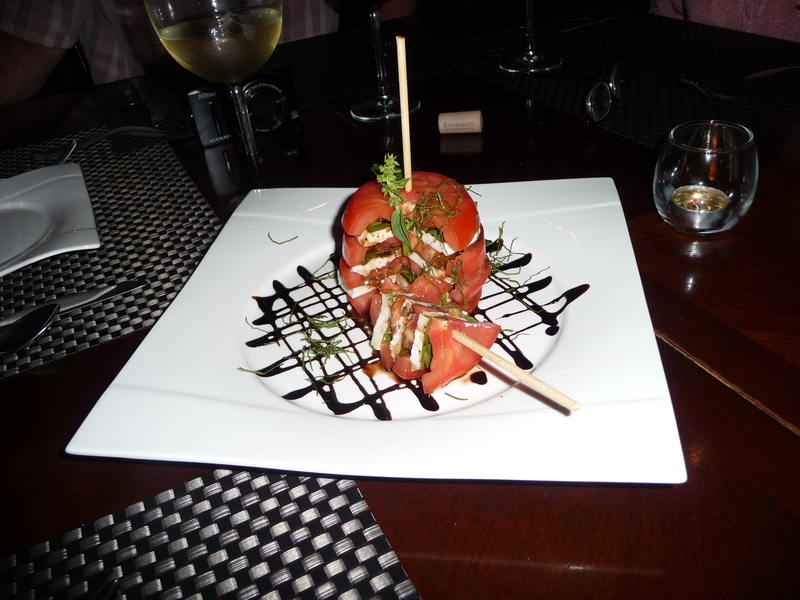 The food, as usual, was VERY good, and the service was excellent. When they heard it was a birthday, they brought a complimentary tempura sliced banana with whip cream (to hold the burning candle). 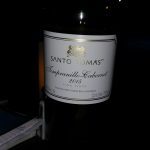 It was a great evening; the waitress received a very generous tip, and we all left extremely satisfied! We were introduced to Blaze Pizza because of a fund raiser. It was last Tuesday from 5:30 – 7:30, show the flyer and they would donate 20% to the school’s choir class. Seven of us went, had 6 pizzas, 3 salads, 2 sodas, 3 cans of beer, and 2 draft beers. The total bill was only $70 — a great value, and they support local groups. Oh by the way, they have a super fast oven that cooks the pizzas in 3 minutes! We always like to find a nice pub on a warm day when we’re in a new city. 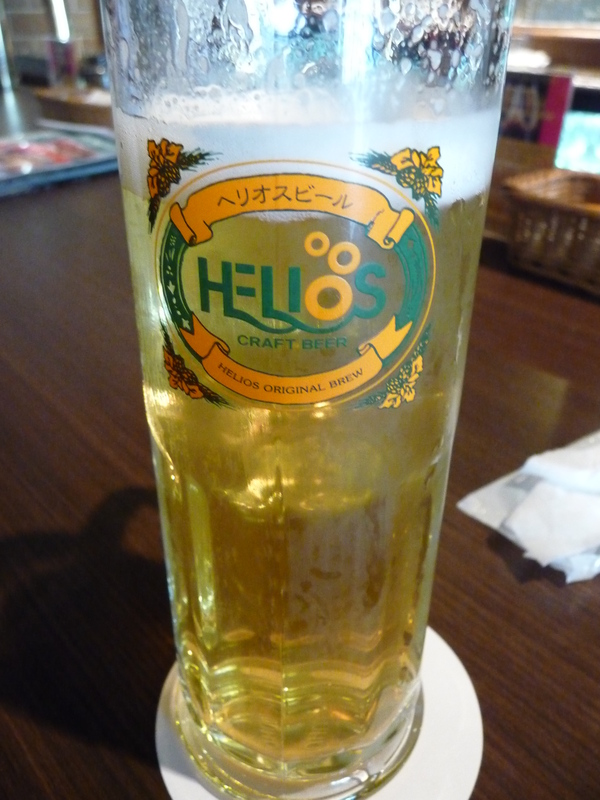 As we strolled down Kokusaidori in Naha City we came across Helios Craft Beer Pub. Some others from the ship were walking out and they said they enjoyed it. So inside we went. I started with the German Lager and then had the Goya Dry. 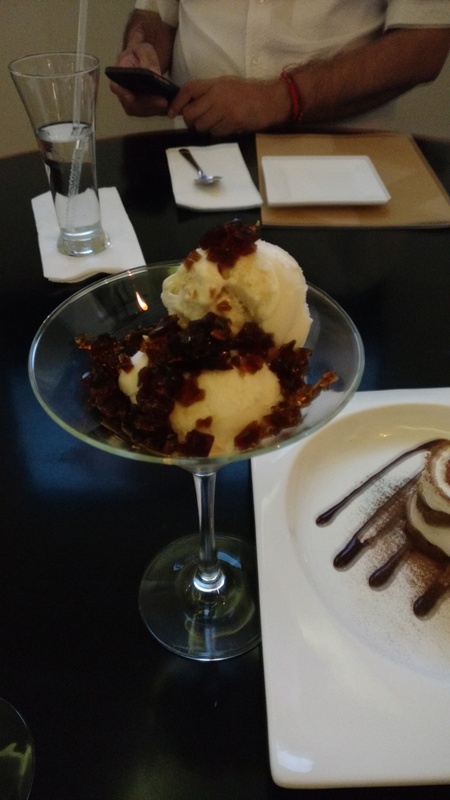 Both were very good, and the bar service was very friendly. I wasn’t that hungry or I might have tried some of their good looking pub snacks. 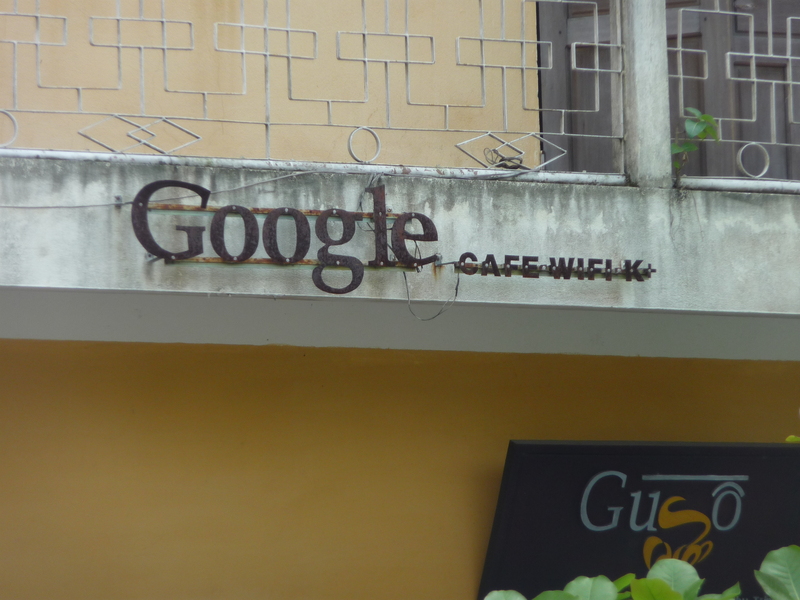 While walking through Hoi An, the name of this restaurant begged to pull us inside. 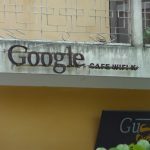 So we went in to see what they were doing to capitalize on the Google® name. There’s nothing much special inside; you can use their wi-fi, but there’s not much else. I would report them to Google, but I don’t think the real Google is all that worries about them. Our ship was in Hong Kong for two days, and we took the complimentary shuttle from the pier to Plaza Hollywood. 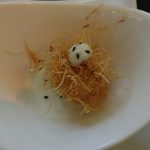 After looking at several of the other restaurants, we settled on Putien where the servers were very nice to us; it was obvious to them that we weren’t locals, but they still treated us with respect. The hot tea was delightful as were the soup and the noodles. Our tour group stopped at Lion Brewery for our lunch, as did many others from the ship. 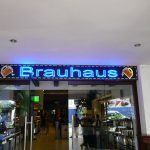 It seemed a bit odd to us that we were going to a German brew house in Ho Chi Minh City (formerly, Saigon) for lunch, but the food was definitely Vietnamese. And the food was good, as was the very cold local Saigon beer. The staff were friendly; the restrooms were clean, and the overall experience was a good one. Just based on the name, this isn’t a place that I would pick for a group lunch, but it turned out to be very good. Five of us stopped in Super Loco last night for dinner. 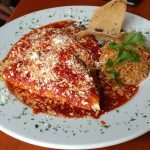 Being along the River we weren’t expecting “cheap Mexican food.” Initially the service was attentive and quite good as we pored over the menu and made our selections. It turns out that the food was very tasty and innovative (hats off to the chef), but there were no customary chips served (for free), and then the food was brought in 5 separate orders. 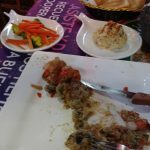 Two people were completely done before the others had even received their food — management needs to train the staff to do a better job. A table of five wants to dine as one table of five, not as five individual diners! We went walking along the River after dinner, stopped at a very busy Brewerkz for a drink. The service staff was very attentive and cleaned tables as soon as people left. We were seated right away and ordered a Pilsner and a glass of wine. Nothing’s inexpensive in Singapore (unless you go to where locals go in Chinatown), but the drinks were good and the service was very good. They automatically add a 10% Service Charge on the tab, so that takes care of the tip. We were passing through SFO on our way to Singapore and we wanted something to eat before our long trans-Pacific flight. We’ve eaten at Tomokazu many times in the past, so going there was an easy choice. We shared a sushi plate and the tempura appetizer (2 shrimp and 4 vegetables). It was good and the service was also nice. It’s nice to see local businesses still around after so many years. 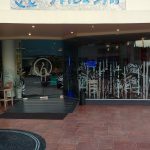 At the marina end of the Puerto Paraiso mall are three “high-end” retailers — Señor Sweets; Harley-Davidson, and Ruth’s Chris. The fact that they stay in business is testament to their delivery of excellent service and value. 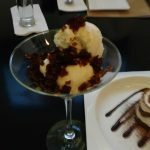 Four of us had gelato, brownie, etc., at Señor Sweets after dinner and the bill was 300 pesos ($15) — an amazing value given their location and the quality of their products. 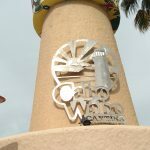 We stopped in at Cabo Cantina as we were headed next door to the Caboholics Store. 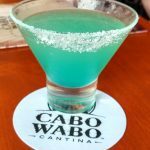 The drinks at Cabo Cantina are always fresh and cold, and you get a discount when you’re a member of the Caboholics (they support amazing charities and organizations here in Los Cabos). 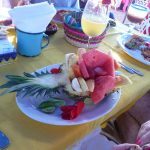 The food here’s also good, and you’re definitely bound to run into gringos who truly love Cabo! 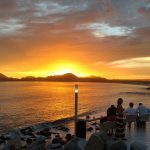 Part of our annual family getting together in Cabo is a dinner at Pitahayas Restaurant at the Sheraton/Hacienda del Mar. The dining area under the huge palapa is so well managed. We started with an complimentary ginger soup — yummy! After our ordered appetizers came a palate-cleansing mango sorbet and then the main course. 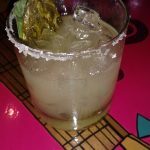 Several of us had made-at-the-table custom margaritas from the rolling cart — mine was pineapple-ginger flavored and very tasty. 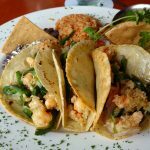 My main was three large shrimp on breaded avocados — and I couldn’t even eat all the avocado. This is an excellent restaurant with a highly skilled staff. It’s a tradition with my brother and our wives. After our annual dinner at Pitahayas we go upstairs to Girasoles for a Mexican Coffee. The show that’s put on as they are made is amazing. My video of the waiter making all four is about 8 minutes long — complete with flames being poured back and forth. They’re great — both the show and the coffee! 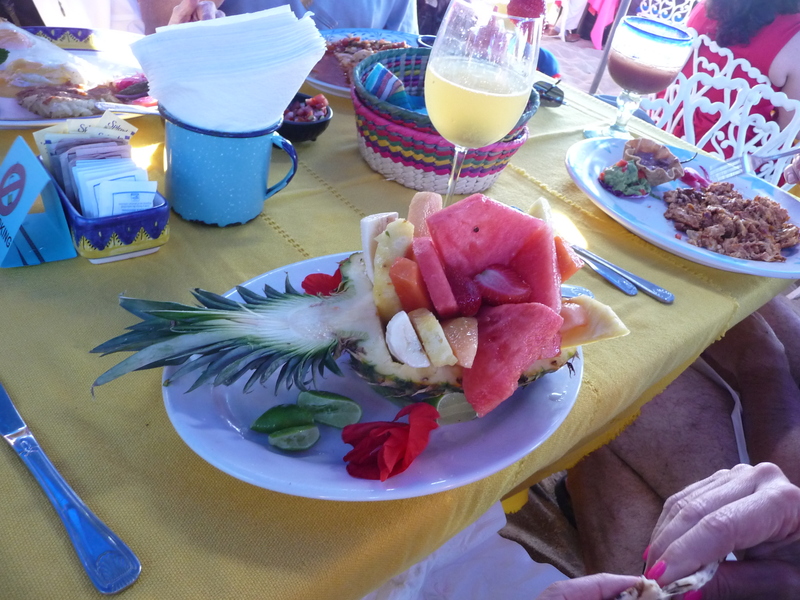 See my YouTube video of the making of a REAL Mexican Coffee drink in Cabo! 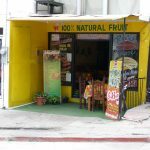 Molly’s has the perfect location — it’s on the corner diagonally opposite the church and across the street from Plaza Mijares. After strolling through most of the Art District we sat under their shady umbrellas for a break. 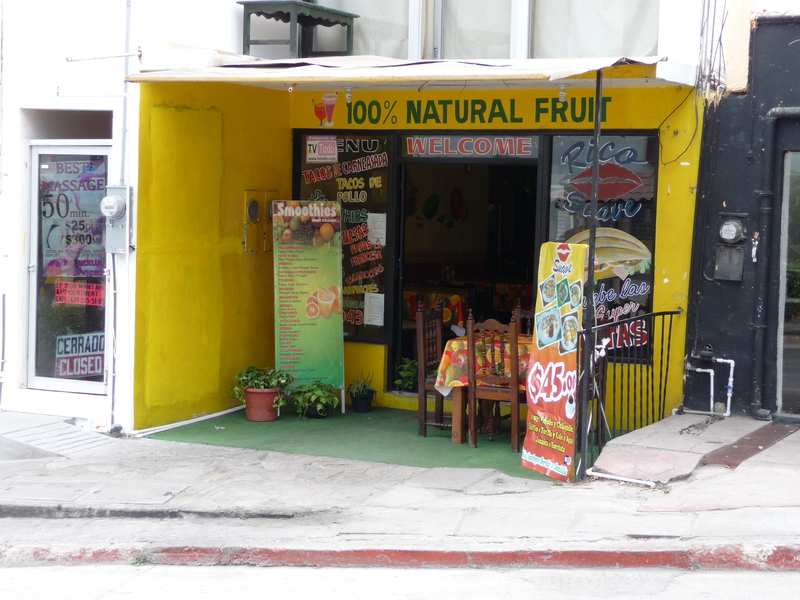 We had soft drinks, iced tea, and guacamole and chips (they do provide a small serving of complimentary chips and salsa) as we watched locals and tourists enjoy their day. Molly’s also has a nice menu but we had other dinner plans already — they weren’t busy so we weren’t taking a table they could have otherwise used. After some shopping we decided to stop for lunch at about 1:30. I’d never been to Tequila’s Sunrise Bar & Grill so we agreed to give it a try. 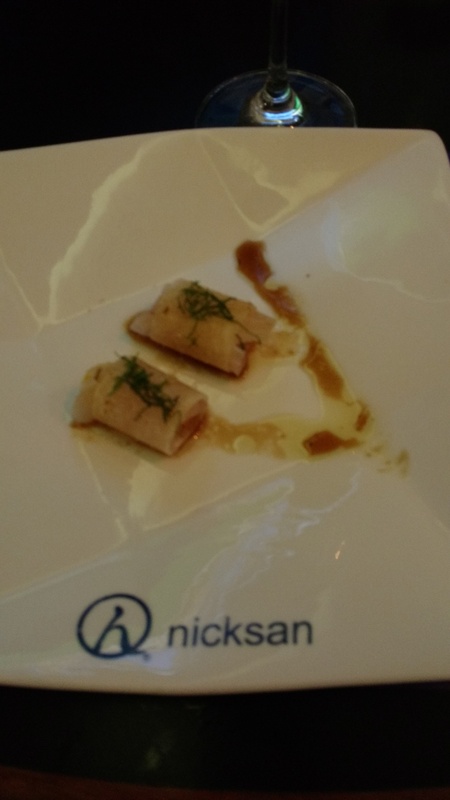 The food choices were excellent, and the flavors were amazing. Between the four of us we had: Tostadas; Enchiladas; Tortilla Soup; Caprese Salad. I was the driver so I just drank my bottle of water while the others had (1) Tequila Sunrise and (2) glass of Pinot Grigio. I’m glad we stopped in a gave it a try — excellent service! I expect we’ll be back here on our next visit to Todos Santos! Okay; we’re crazy. But we’re not into all the hype and noise of Super Bowl. We went to Maro’s last year on Super Bowl and there was only one other couple there. Same for this year, a nice couple from the States that we enjoyed their conversation without the blare of the television. We each had the quarter kilo of lobster and quarter kilo of medium grilled shrimp — so yummy as it’s been for the last 8+ years we’ve gone there. So great; always delicious! We’ve always loved the sushi that Armando and his team make at Solomon’s Landing. We particularly liked the quaint sushi bar at the back of the restaurant where they had awesome specials. But once they were featured with Guy Fieri on Diners, Dives, and Drive-ins, prices went up, the sushi part moved to part of the old Wamango restaurant, and their prices also went up. 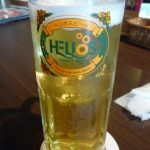 Don’t get me wrong — the sushi is great here, but there are other places in town to get great sushi at much more reasonable prices (and we’ve been there and I’ve reviewed them!). Sorry, Mr. Solomon, our business goes elsewhere. We’ve come to Playa Grande Resort each year since 2003. 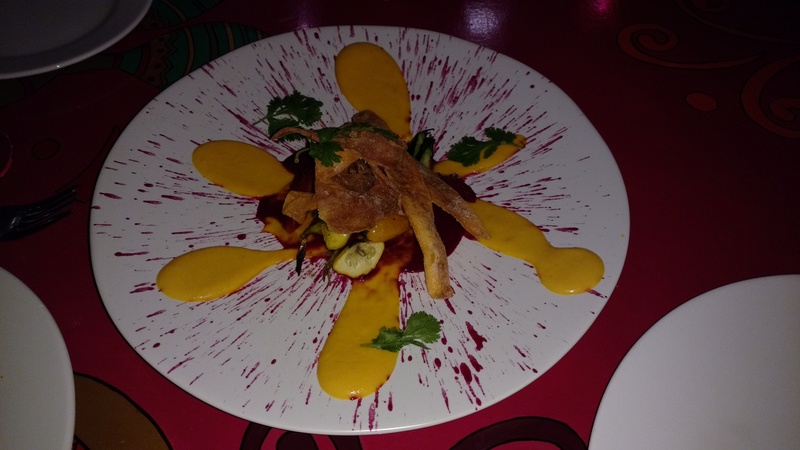 We had previously enjoyed the Tortilla Soup at Calima, the outdoor restaurant. After spending some time at the pool yesterday, we went to Calima to have the Tortilla Soup. Sadly, it was not on the menu. We told the hostess that we were disappointed as it was on the room service menu, but not at the restaurant. She went to the restaurant captain who promptly said, “We’ll make it for them.” That’s what I call outstanding service from two people! By the way, the soup was very tasty!!! p.s. My TripAdvisor review had a nice reply from General Manager Ramon who was very pleased that his staff took the initiative and “did the right thing” for the guests. ¡Gracias, Ramon! We’d already eaten lunch but we knew we wanted some chicken and ribs so we went to El Pollo de Oro, sat at a table, ordered a beer (Pacifico) and a full order of chicken and of ribs to go. Rather than the standard macaroni salad, we asked for the mixed (lettuce) salad and it was provided at no additional charge. The chicken and ribs (with the rice, salad and tortillas) will last us for several meals and they’ll all be delicious. 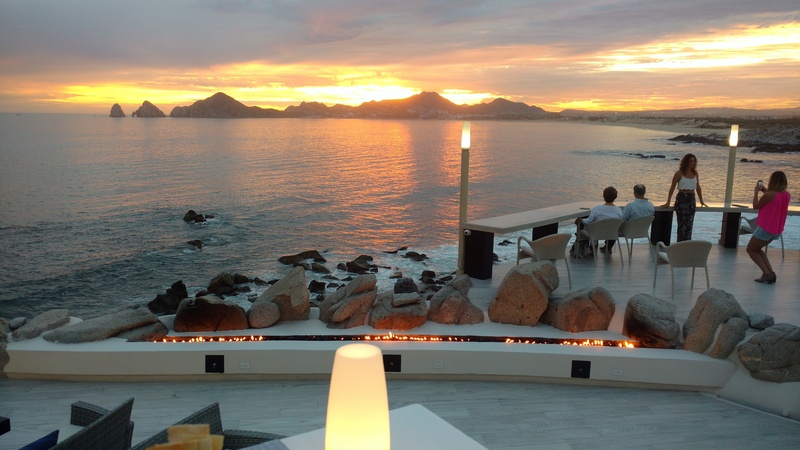 This is one of our favorite places in Cabo and we gladly tell people about it. Don’t be surprised when you see mostly locals in here; that’s a true indication of the quality and value of their food! We don’t come down to Cabo to eat cheap meals, but we also don’t look to spend a ton of money. 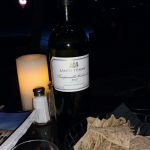 The one thing we do splurge on each year, however, are the plates of Oysters on the half shell and chilled Chardonnay wine at Lorenzillo’s. The location on the marina, literally over the water, is a great place for enjoying the view and for people watching. We shared a dozen oysters and a bottle of wine — what a great afternoon snack! We’re already looking forward to our visit in 2018! It had been a few years since we’d eaten at Captain Tony’s. They are great for taking any fish you catch and turning into a tasty meal. 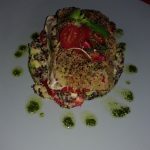 Tonight we ordered a blackened tuna fillet and a white fish with ajillo sauce. Both plates had a nice serving of rice and julienned vegetables, and they were delicious. The table of six next to (4F, 2M) announced it was their last night — and they had fun. Margaritas and dancing — all in good taste — made everyone around them sing along. A great evening! p.s. We did return to Captain Tony’s a few months later with our small-group tour — another great experience! 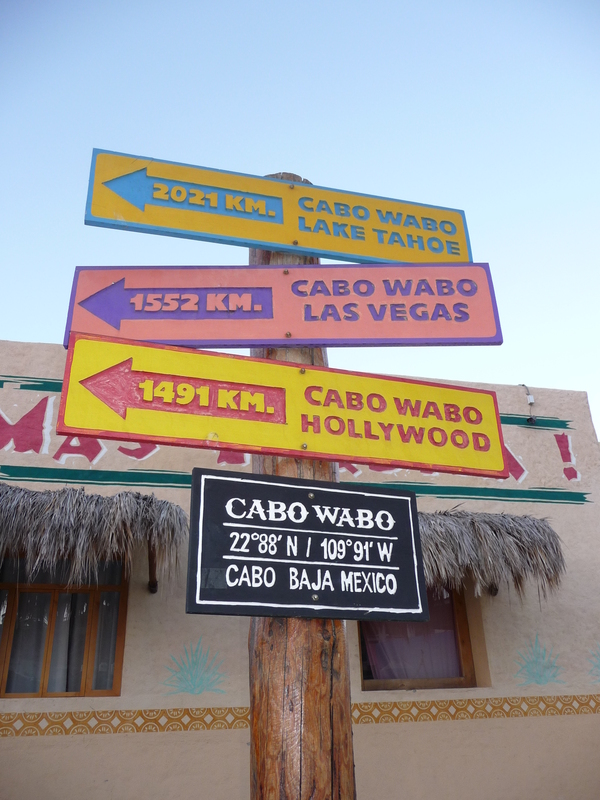 Right at the entrance to the much-more-famous Cabo Wabo, Taco Loco offers good food at amazingly great prices. It’s hard to pass up their “4 tacos and a beer” for $7 USD. 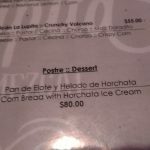 When the pricing is done in pesos, it’s even a better deal at today’s 20:1 valuation. We’d just sat down and ordered when a couple from Calgary (Al and Jodi) came in. We’d met them yesterday on the shuttle from the airport. 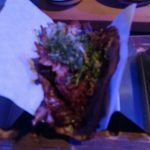 We ended up sitting together and chatted about our Cabo adventures, and we ate great tacos! 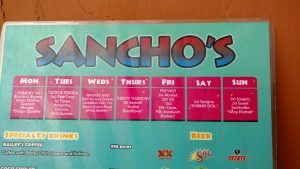 Taco Loco also serves daily specials, but it’s the tacos and beer pricing that always draws us in! After we bought our bag of coffee next door at Cabo Coffee, we went into Sushimaniaz as we remembered how great it was the last few times we’ve been in there. AND they did not disappoint us! We started with a Citrus Sashimi — an artistically created plate of raw tuna with Serrano peppers, lime juice and tamarind sauce. SO GOOD! As we waited for the two rolls to arrive, our waiter brought us two pieces of sushi as a gift from the chef. I don’t know what was in them, but they tasted every bit as great as they looked. When our rolls arrived, we were in sushi heaven. The Spicy Tuna was awesome and the other mixed roll was worth savoring each bite. The service all evening was amazing, and we’d love to go back EVERY NIGHT but there are other restaurants that we also really love. The bill? With the plate of sashimi, the two rolls, and five ice-cold Pacifico beers, the total was 610 pesos ($30.50). Obviously a large tip followed. 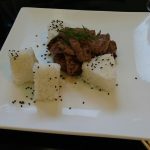 If you love sushi, you MUST try Sushimaniaz before you go to any of those highly touted places (and I’ve called out some of them!). 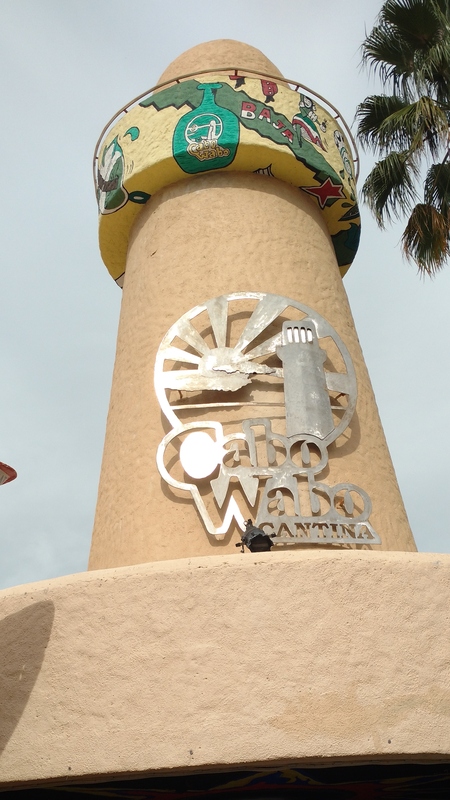 After we checked into the resort we headed back into town, and our first stop was at Cabo Coffee. We bought a bag of their Dark Ground Roast. And with their VIP card (buy 9 get the 10th free), we get 15% off the bag — so it was only 115 pesos (not even $6); and the resort wants $16 for a smaller bag of coffee. Not only do we like their coffee, we bought their coffee cups a couple years ago and they travel with us to Cabo every trip. The corner location is so convenient to awesome restaurants (we had sushi last night) and any place you want to visit. They’re open ealry and late so you can get your brewed coffee fix at almost any hour of the day (or night).